Part of the fun of Christmas for me is the making of both gifts and Christmassy stuff. It’s an excuse to make all sorts of things. In the lead up to December, we were busy with lots of such projects, but because they were presents, I haven’t said much about them. 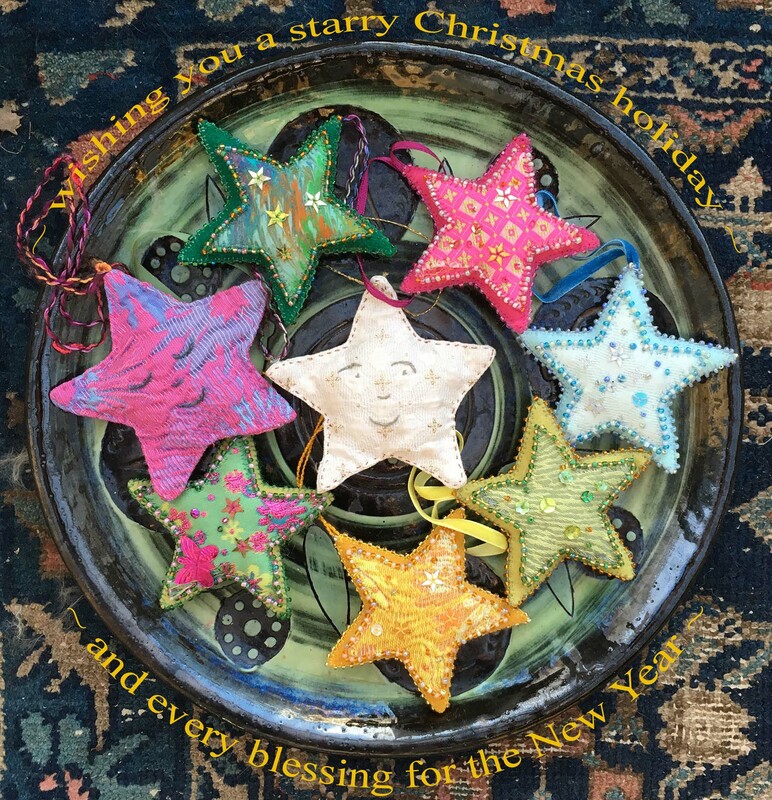 Now – with Christmas well behind us – this is the opportunity to show what we were busy with in those autumn months. 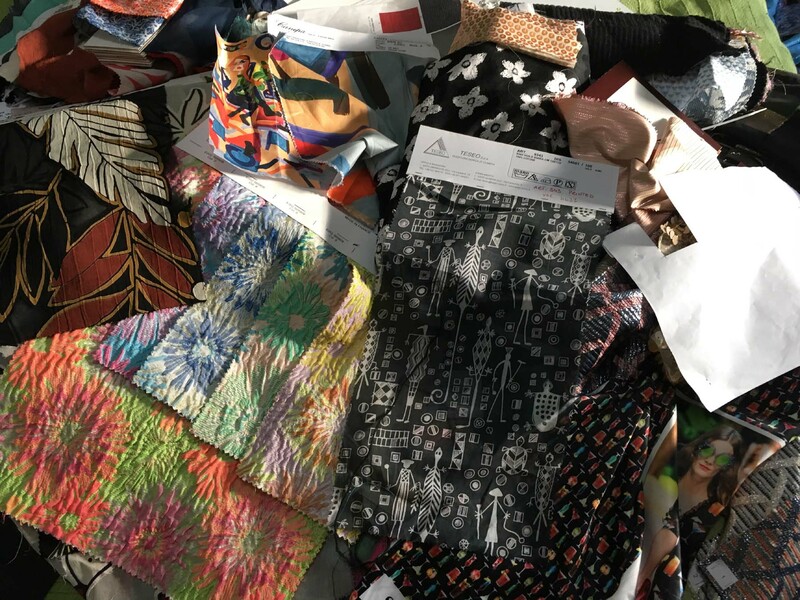 I started my GiveWrap making in September with lots of fabrics spread around, and some very intriguing printed pieces from my cousin Polly. When I’m working with Polly’s prints, I sort them first into colours, and themes. These two predominantly blue GiveWraps mainly incorporate a mix of her human body prints. 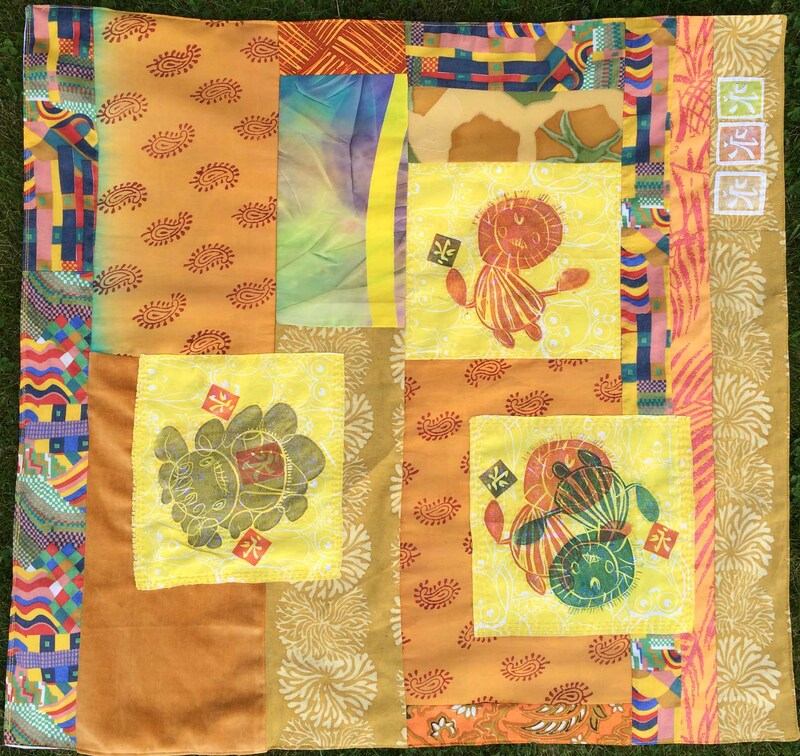 Her images are bold so I try to marry them up with fabric that has equally strong images – thus, in the top example, there are striking Japanese ladies from an old yukata, and some wonderful owly pieces too. The images in the lower givewrap are softer in colour and tone, and have accompanying softer fabrics. Other prints from Polly inspired work in different colourways. Her “little people” are all facing inwards here, dancing to the central tune, in a golden melange. It’s a particular favourite of both of us. 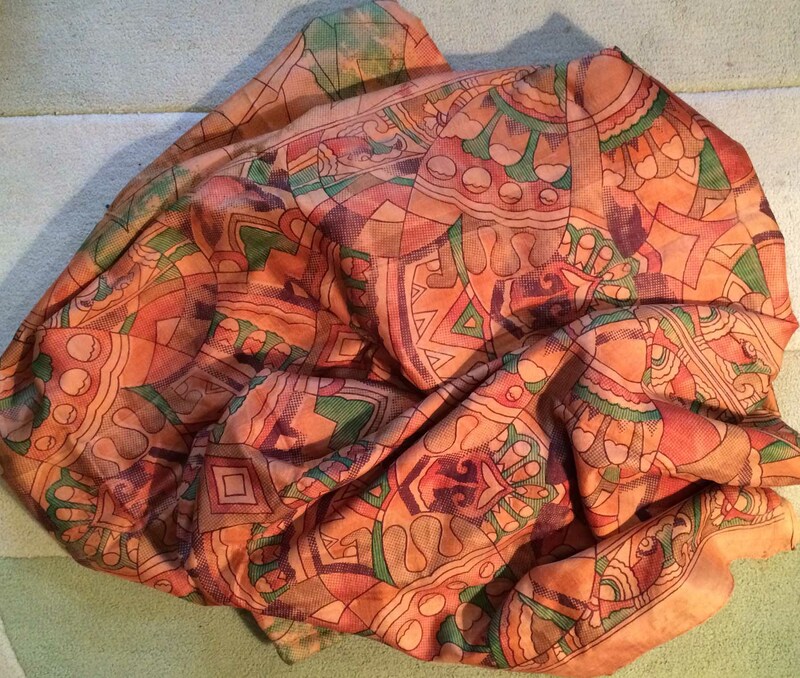 This wine-coloured GiveWrap is at heart a worn-out cushion cover of Polly’s. I covered up the holes with bits of new fabric, and built up the edges. Later in the autumn, I made more GiveWraps. 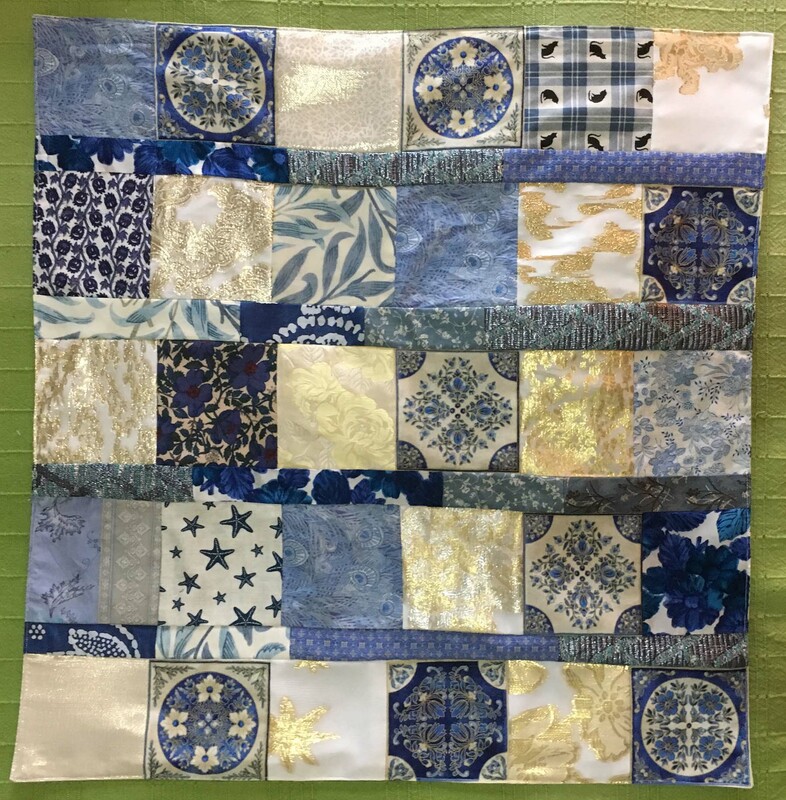 These blues, yellows and golds worked so well together that I got carried away and made two more similar GiveWraps. 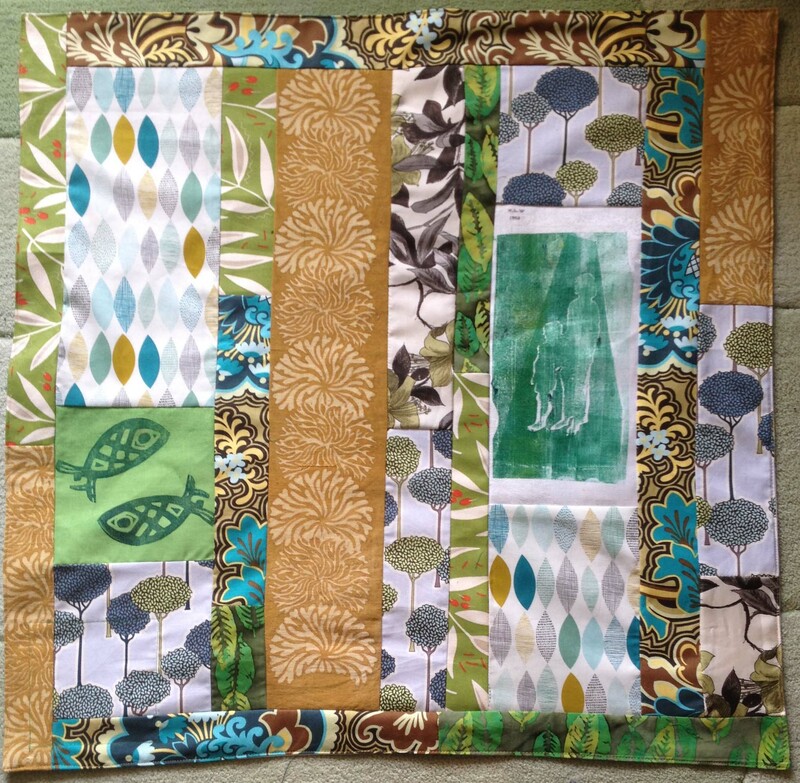 Another old cushion cover (this time an old green one of mine) got re-pieced here. The holes and stains were removed and I added some strong contrasting purple. Interestingly, this GiveWrap attracted more interest and likes on Instagram than any other that I have made. 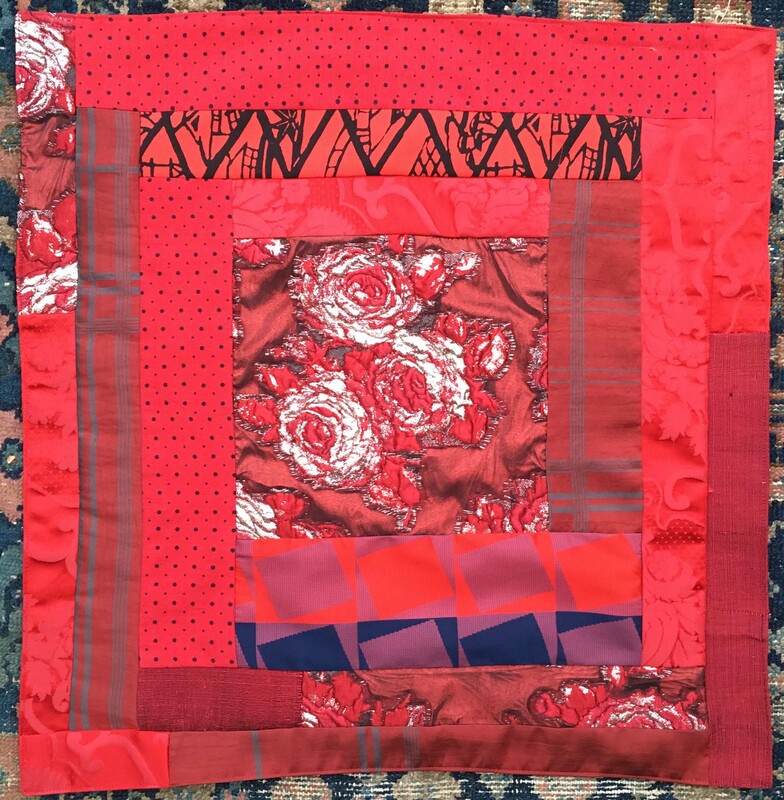 Lastly, I made a small red silk GiveWrap with my mother in mind. This to my mind is the best of the lot! I loved it – was sad to part with it – but my mother loved it too. And when a recipient loves the gift that is best of best! 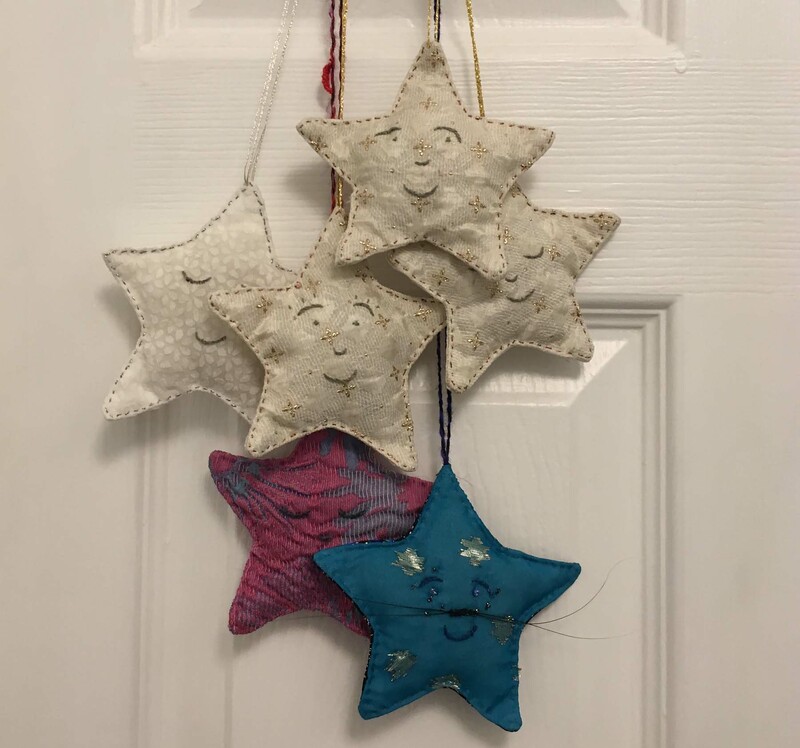 Off they went to new happy homes, bearing Christmas wishes and love! 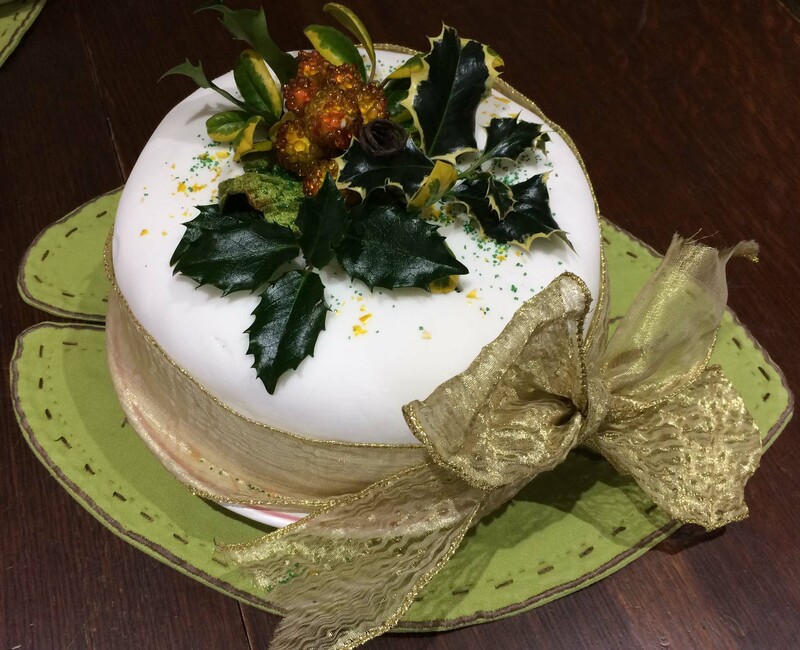 Apart from GiveWraps, there were practical things to make like the Christmas cake – here garlanded with our own gorgeous glossy holly. We also made jams and jellies. 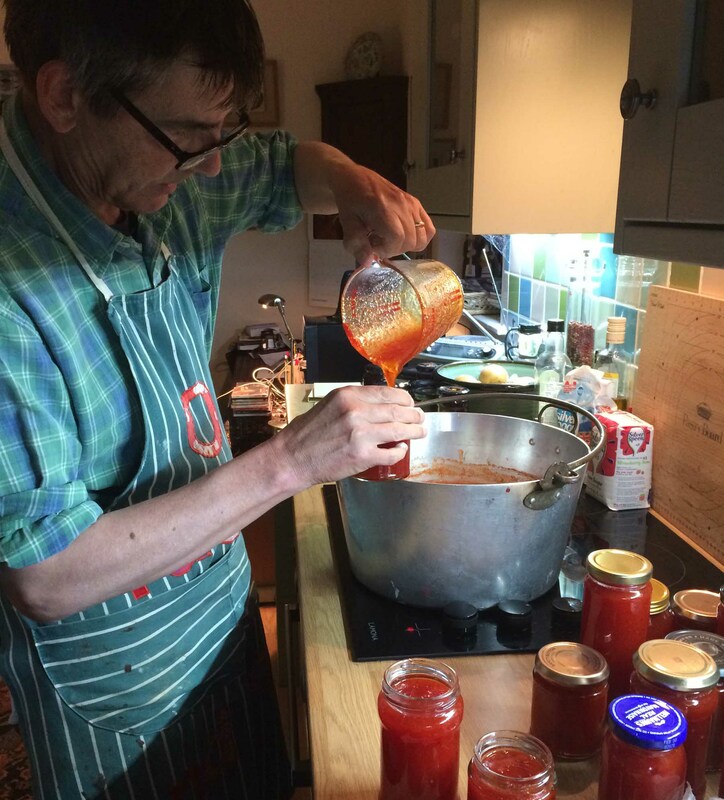 Here’s Stephen concentrating intensely as he pots up his chilli pepper jam. 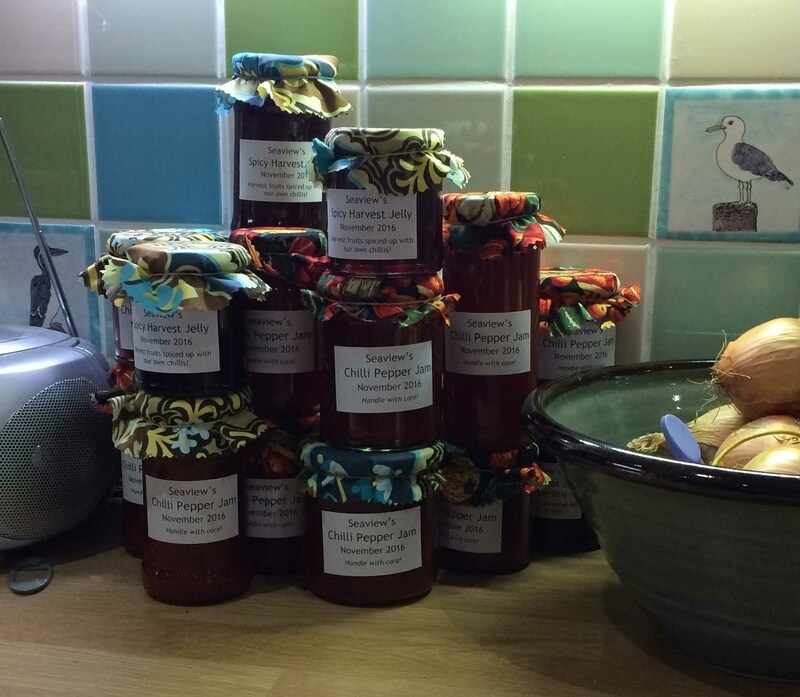 The finished products – chilli pepper jam and spicy harvest jelly – don’t look bad for Christmas presents, do they? 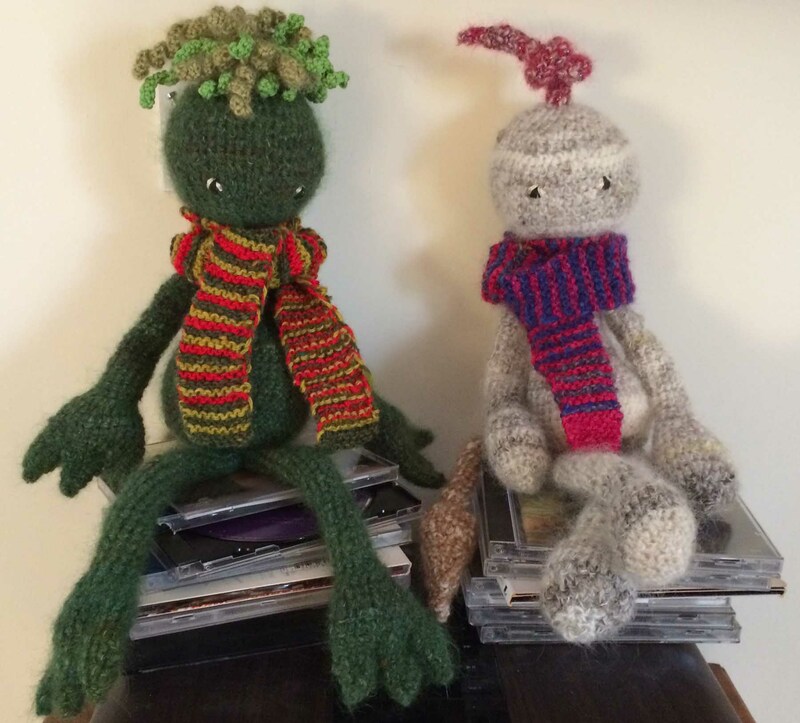 I made two little Toft monsters this year as gifts. 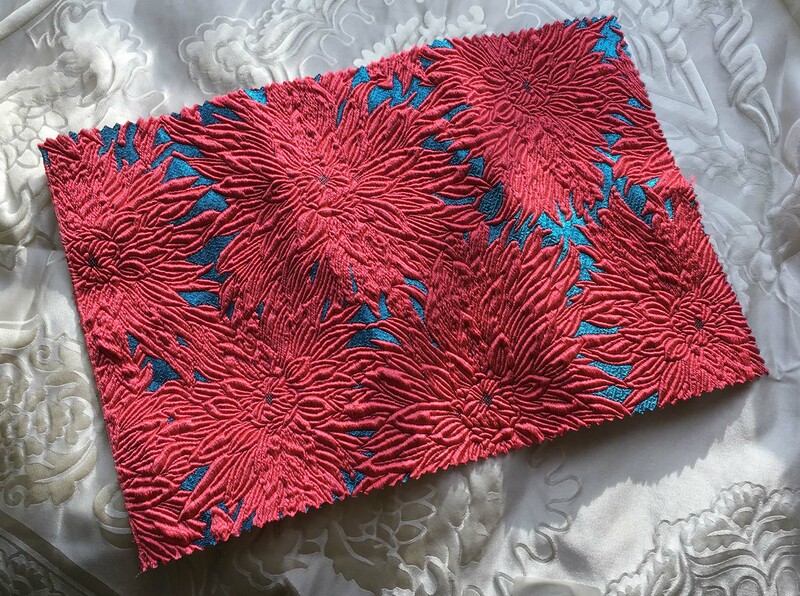 The patterns come from Kerry Lord’s brilliant flip book of patterns, Imaginarium. 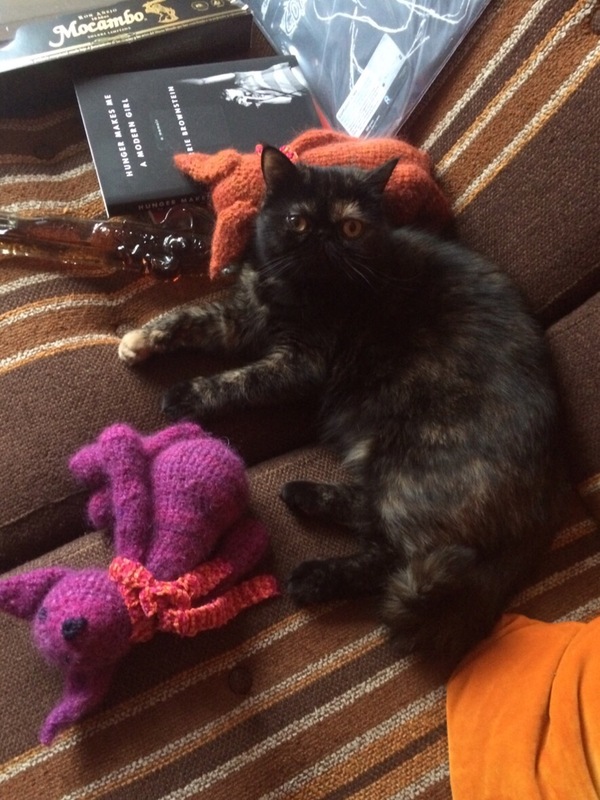 A mix-and-match pattern book to enable the crochet creation of just the monster you want. 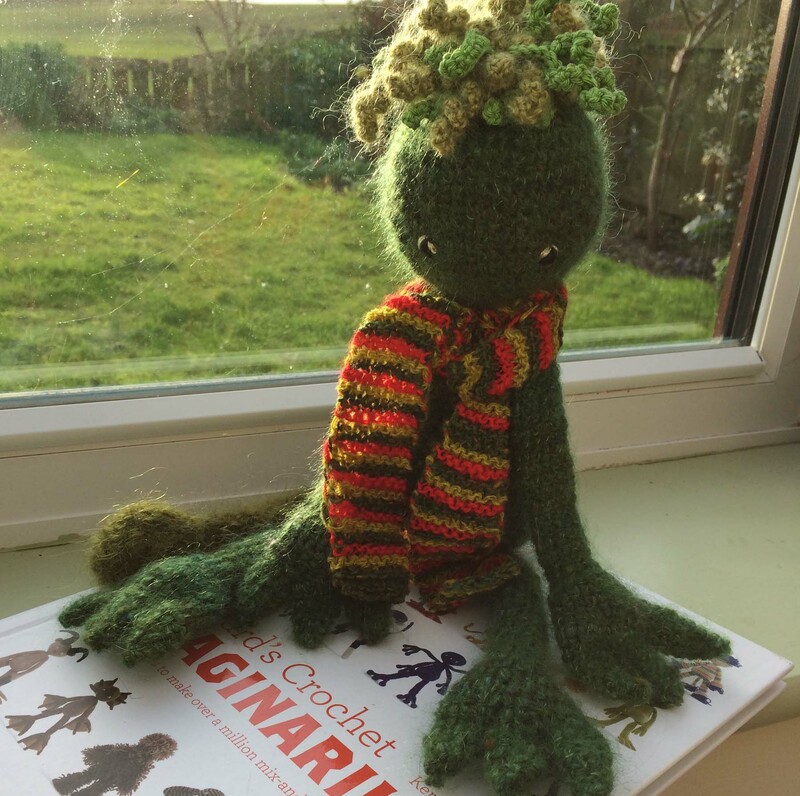 The other little monster I made is quite different – but that’s the whole point of a book with so many pattern choices! Different they may be, but they look like good friends, sitting here together. 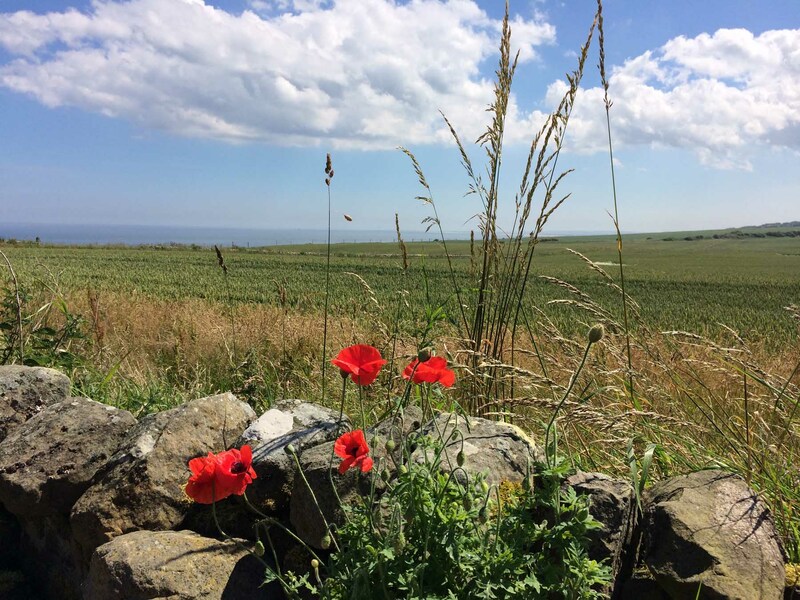 You may have read an earlier blog I wrote this autumn about our Seaview poppies … we collected as much seed as possible, and packaged it up to send off to friends and family, hoping to spread a little bit of poppy colour in other gardens. I made hats too. Some I forgot to photograph. 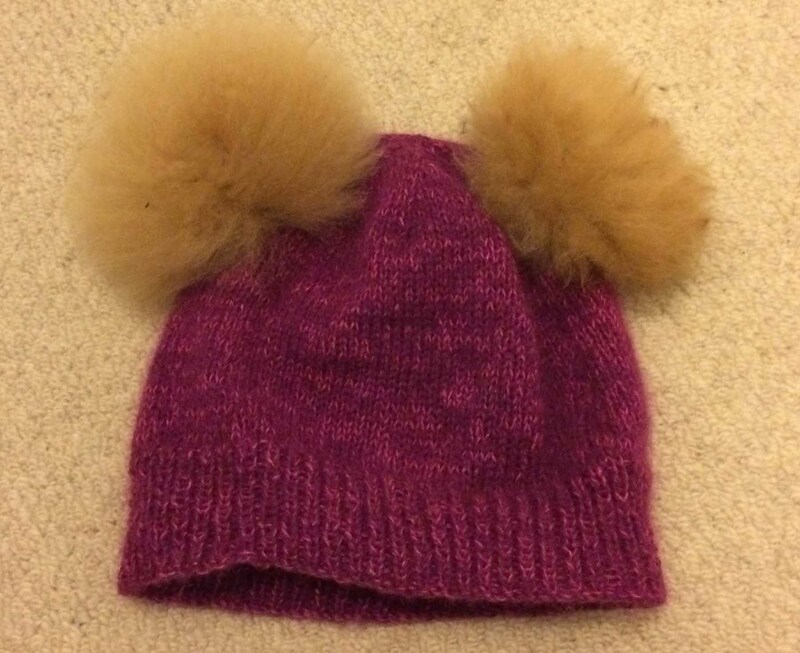 But one I did remember to photograph was this pink two-eared beanie for my daughter. 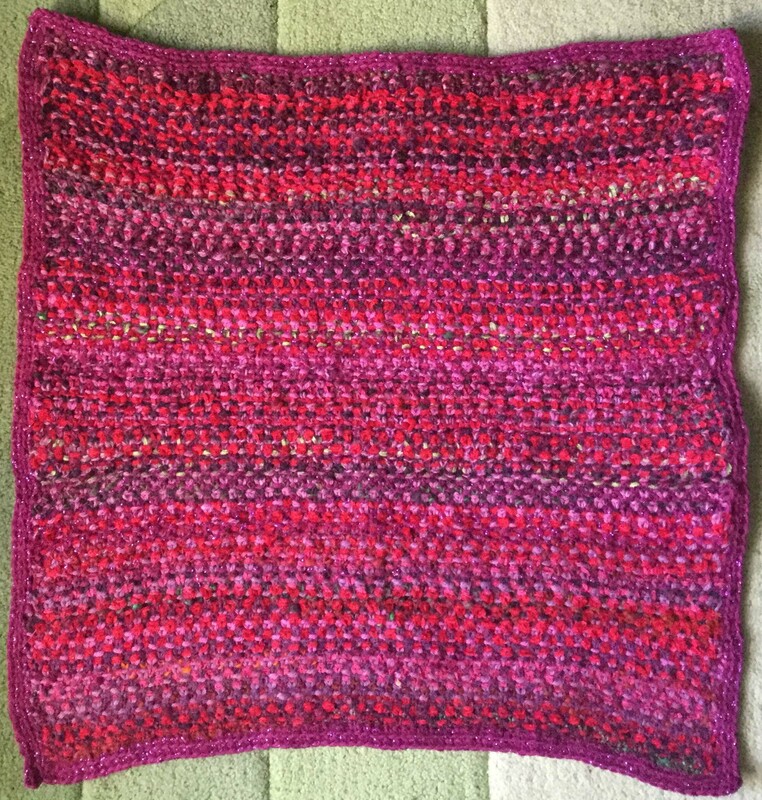 The pattern came from my beloved ancient (1977) Paton’s Woolcraft, and I knitted it using odd pink scraps from my stash. 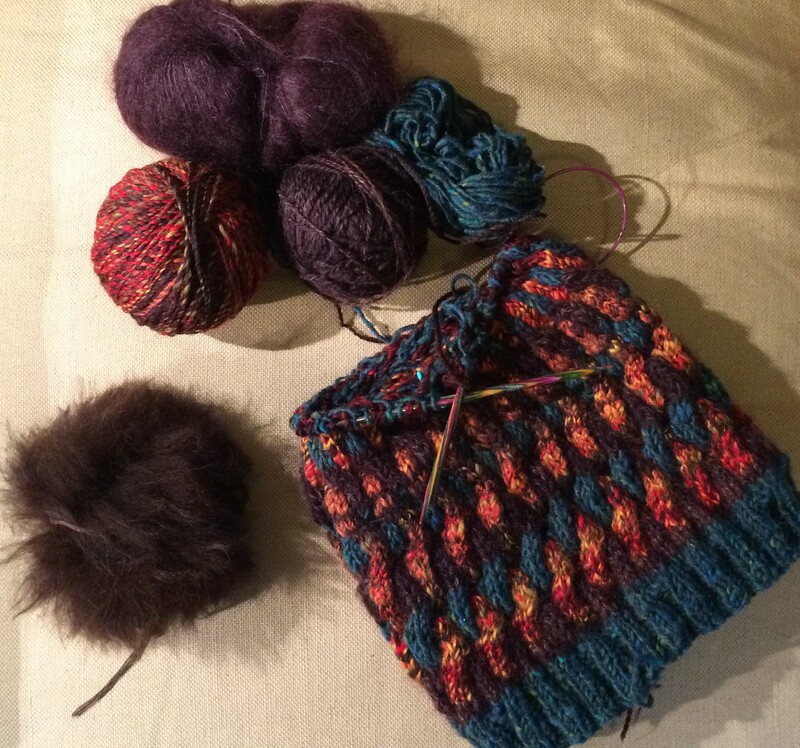 The scraps included some Rowan Kidsilk Haze so together with the alpaca pompoms, it was a fluffy hat! Just right for our beach walks … My son is fascinated (and most knowledgeable about) the periodic table. 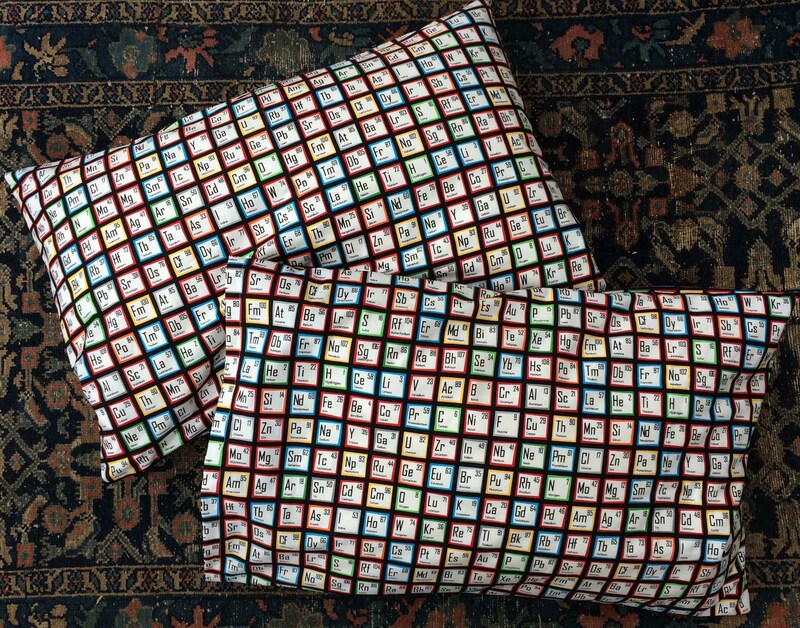 So what better to give him than periodic table pillowcases?! Stephen found the fabric on the internet, and I sewed them up. Does he now dream of the elements of the periodic table? …. I must ask him … There was the usual making as well. You might say, the bread and butter making. 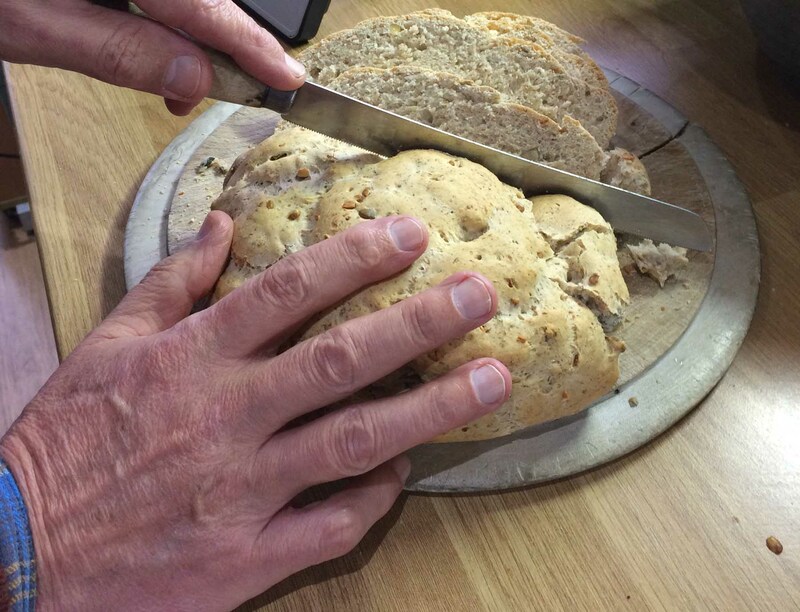 Wonderful to have a man around who makes all our bread. Stephen made some wonderful knits for Christmas presents. 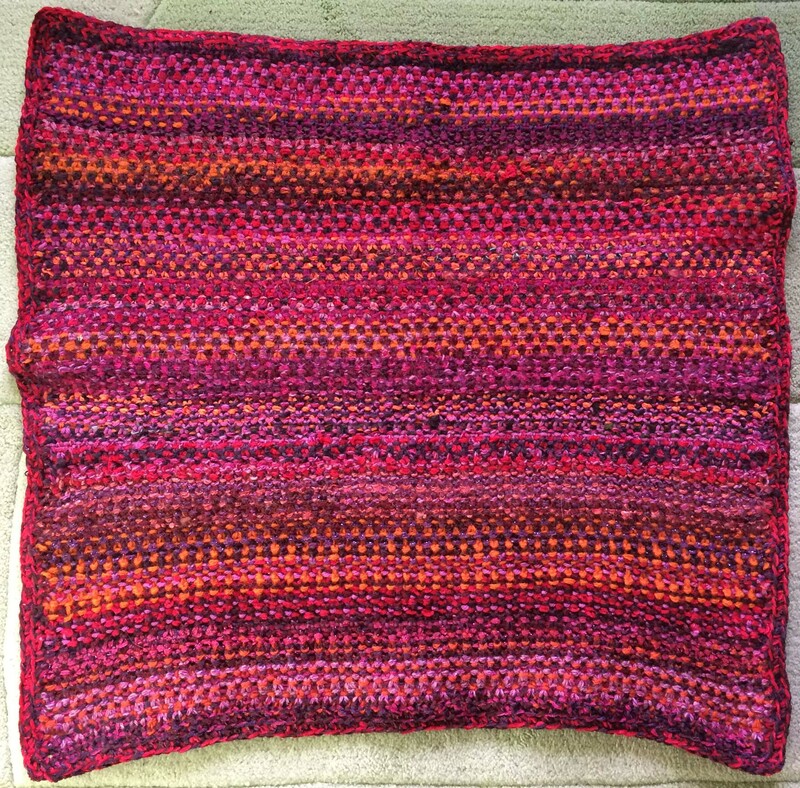 He wrote in an earlier blog about the blanket he knitted on his knitting machine as a present for his youngest daughter. That knit incorporated a knitted monogram of his daughter and her husband’s first initials: J and E. My cousin admired it especially because her two daughters share those particular initials. So how about some cushions with your daughters’ initials on them as a Christmas present for my cousin! 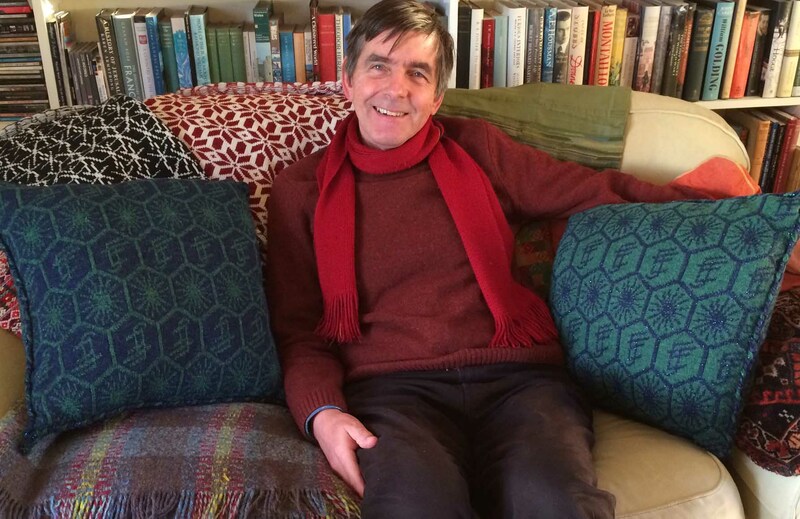 Here is the maker man himself with his wonderful knitted cushions. He made two scarves for other daughters. 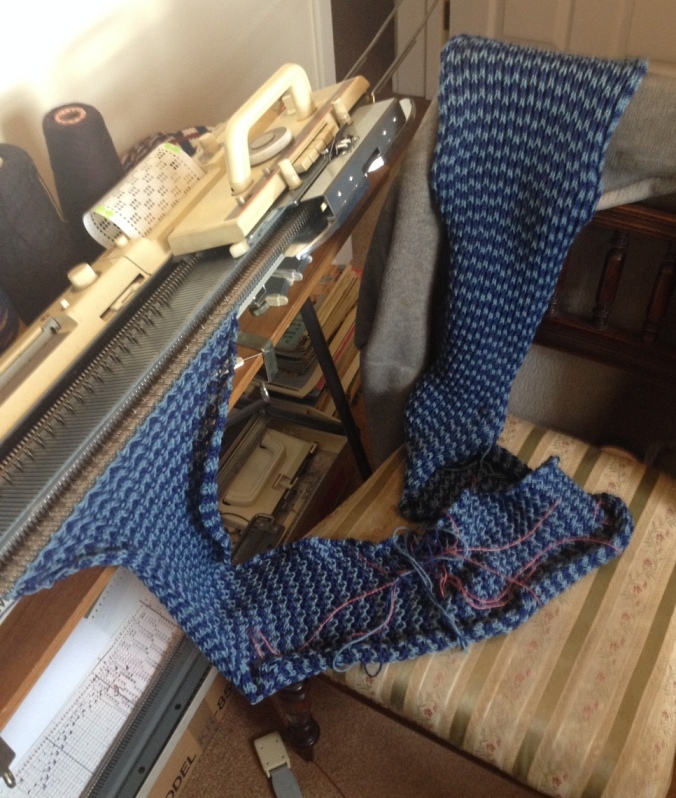 Stephen here: Here is one of the scarves I knitted about to be cast off the machine. For the technically mind it is knitted in 2-colour tuck stitch using every third needle with tension dial set at 10 (the largest possible stitch size) to give a lovely loose feel. The wool is Rowan baby merino silk double knit – in all I needed 100g of each colour. When washed carefully they came out beautifully soft, though somewhat narrower and longer than anticipated. I also experimented with some Christmas designs. Here are two panels I knitted just for fun. 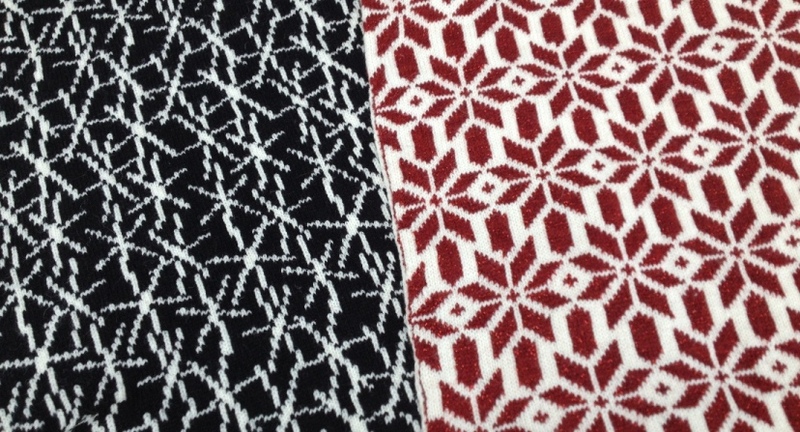 The left hand one is of random snowflakes ( see the end of our blog Ellie’s Blanket for more details of this design) and the second is derived from typical Scandinavian Christmas designs and made using their traditional colours. Perhaps by next year I will have my own machine-knitted supply of Givewraps. 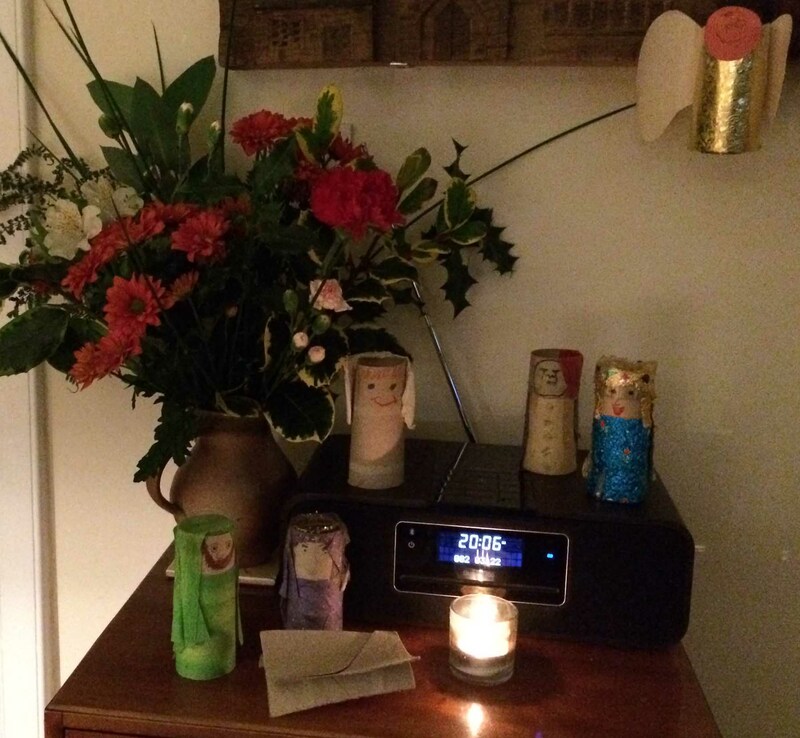 Katherine here: I’ve written so far about the pre-Christmas preparations. 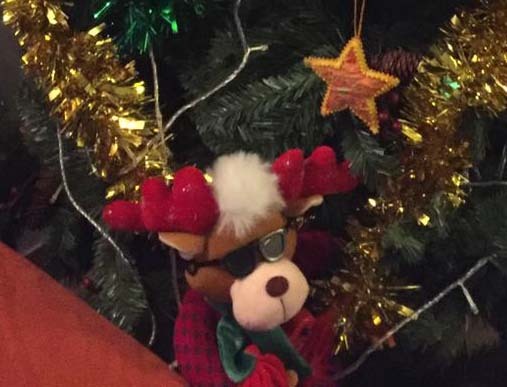 But there was one project we made that involved all of us who were here over the Christmas period. So many ups and downs in 2016! It’s been a topsy turvy year – a year of sadness and upsets for my family and a deeply shocking year in global politics. I have travelled through the year with a pervading sense of loss. But, in the last few days I’ve been indulging myself drawing up a #bestofnine2016 for my Instagram feed. I’ve looked through all the pictures I’ve posted online, and selected the nine pictures that most capture 2016 for me. It has taken me quite a time to finally make a selection, but it was a good exercise because after that, I didn’t feel so bad. So many little ordinary happinesses and pleasures that I have taken for granted! 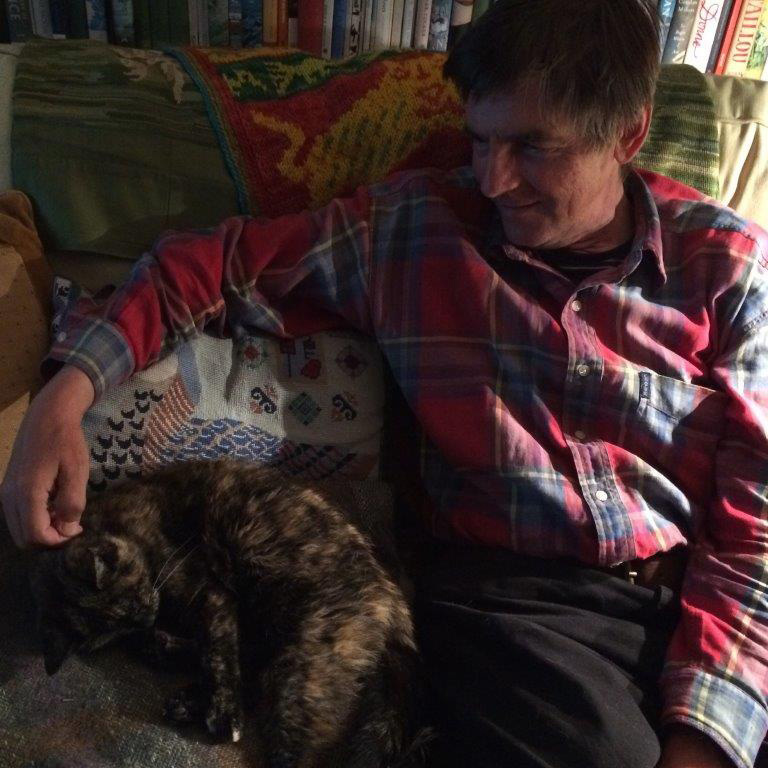 Here are my chosen nine: Top left: That’s my dearest husband Stephen and our lovely cat, Poe, who passed away in her 20th year, this August. This photograph was taken on her last night of life, when we knew she was extremely ill and would have to visit the vet next day, probably to be put down. She is curled up asleep, comfy and trusting, next to Stephen, on the sofa, as she regularly did. RIP Poe, faithful friend. Top middle: Lots of little pleasures here. 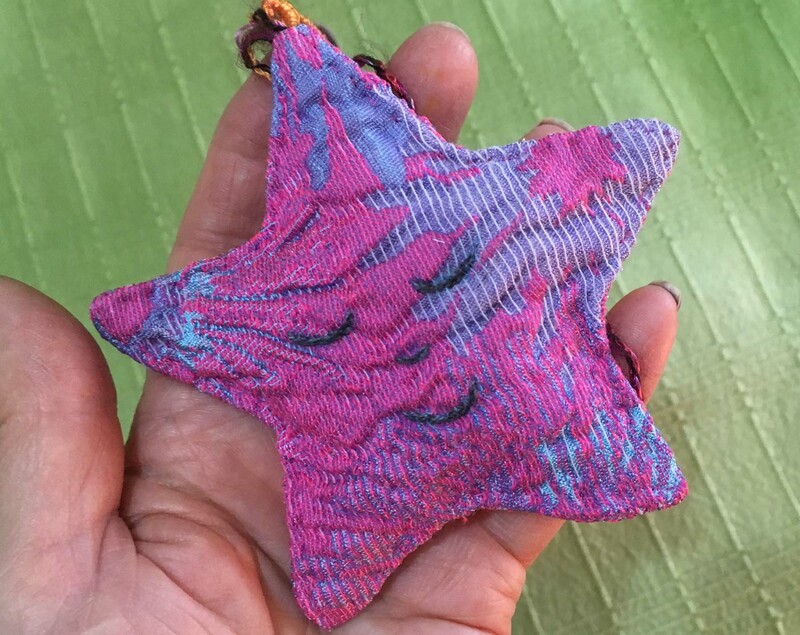 My knitting, my nails – and my travel knitting bag! Those of you who know me well will know I almost always have my nails painted – and doesn’t this colour match the knitting so well! 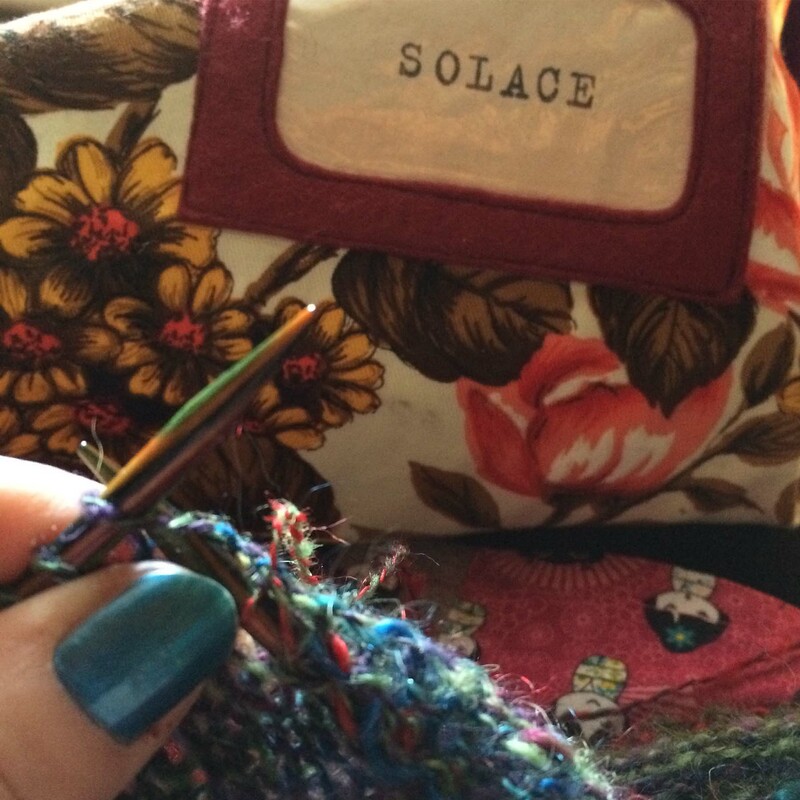 The Solace bag was a generous gift from Rebecca of Needle & Spindle and symbolises to me the constant comfort of knitting, and the friendliness of the wonderful online community of knitters and makers. 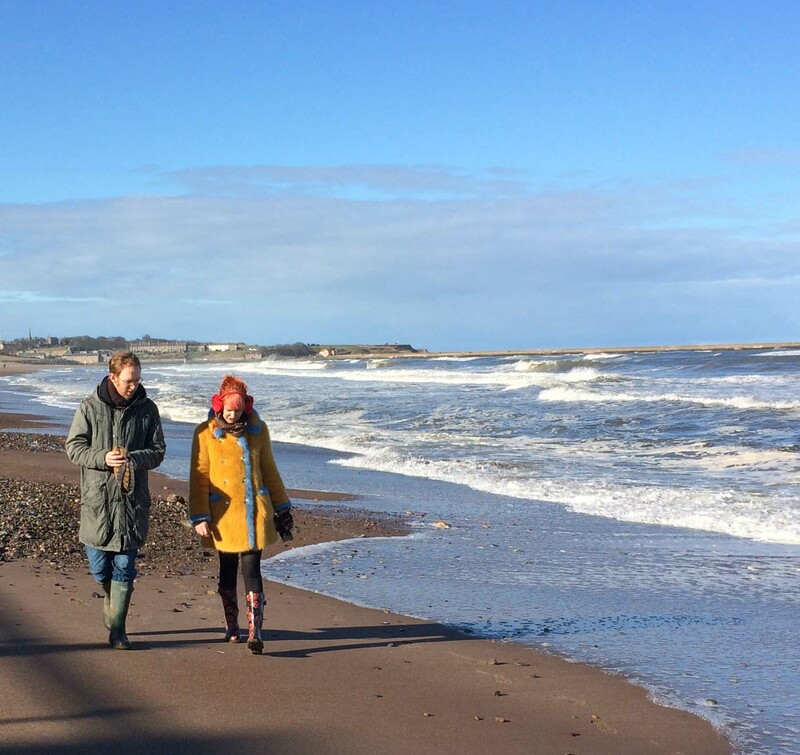 Top right: This is our lovely local beach, just five minutes away from our home, and my very grown-up children, visiting from London, on a beautiful blustery day. Stephen and I walk here several times a week, and watch the tides and waves and sands move, the holiday visitors with their families come and go. To share this with my own family is the greatest of all pleasures. 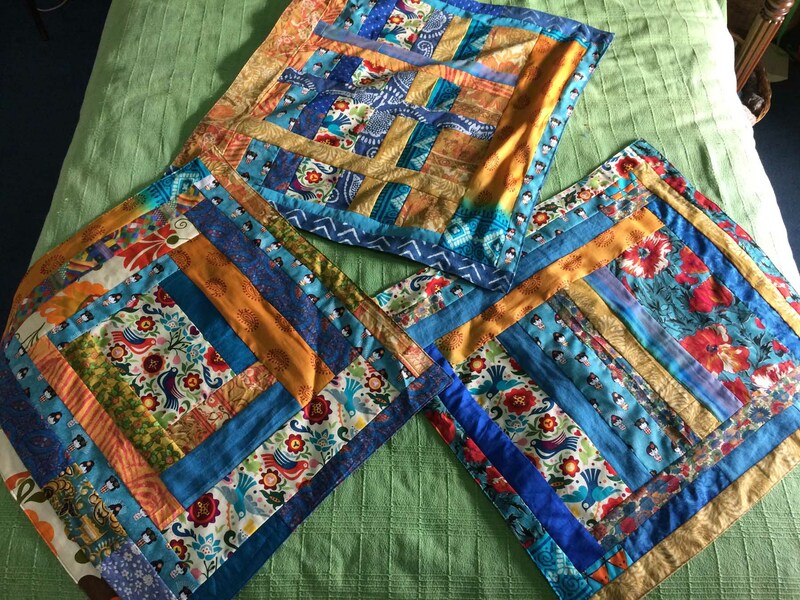 Middle right: A golden GiveWrap, made with the Japanese and Indian silk scraps I was given for my birthday, and mixed up with some very treasured pieces of old clothing. It’s been another year of GiveWrap making, sharing the ideas with my cousin Polly, and spreading the word about sustainable wraps. 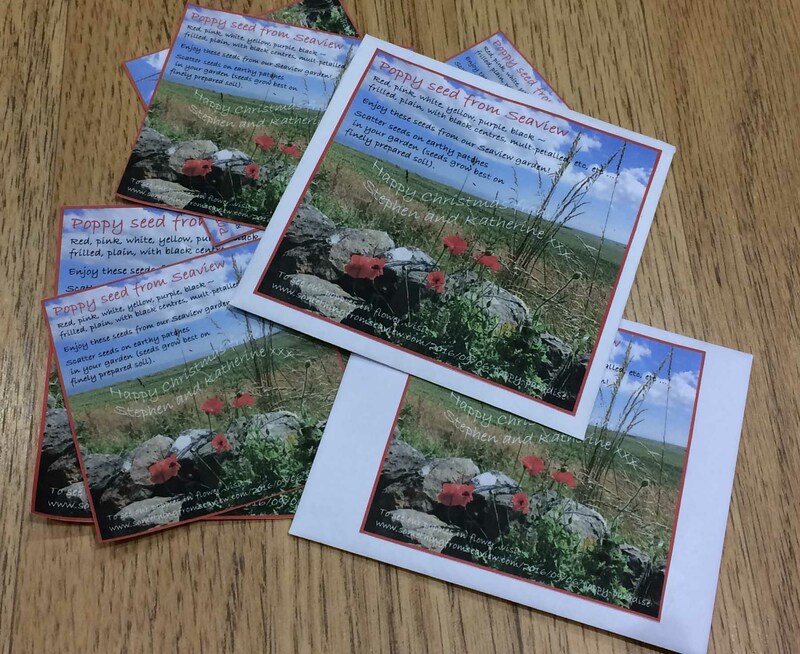 Bottom right: I wrote about the poppies that we grow here in a recent blogpost. 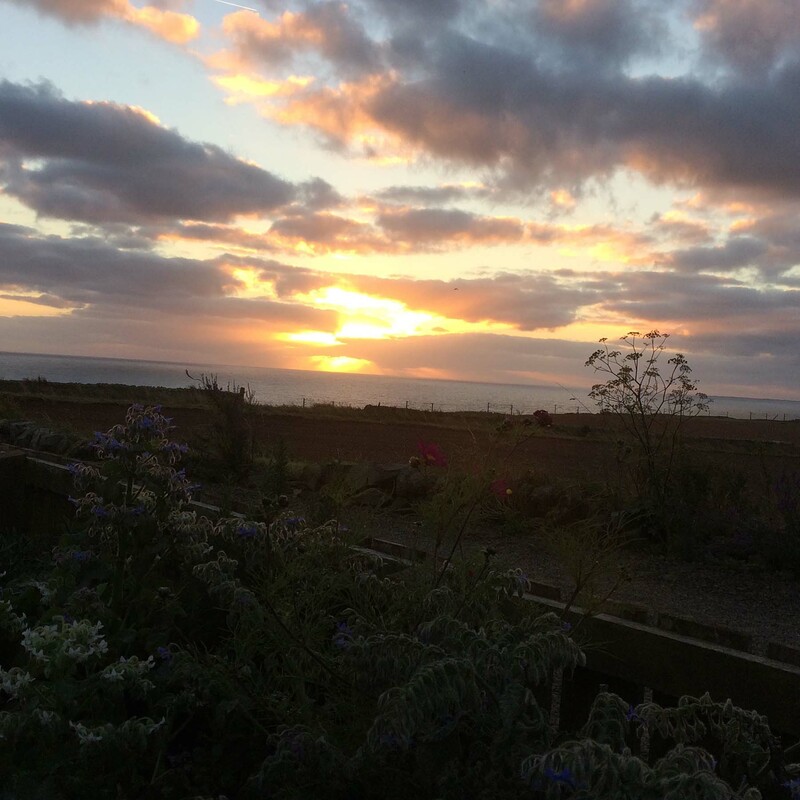 They are the best of our gardening in this wonderful place, right up on the north Northumbrian border, exposed to all the elements. 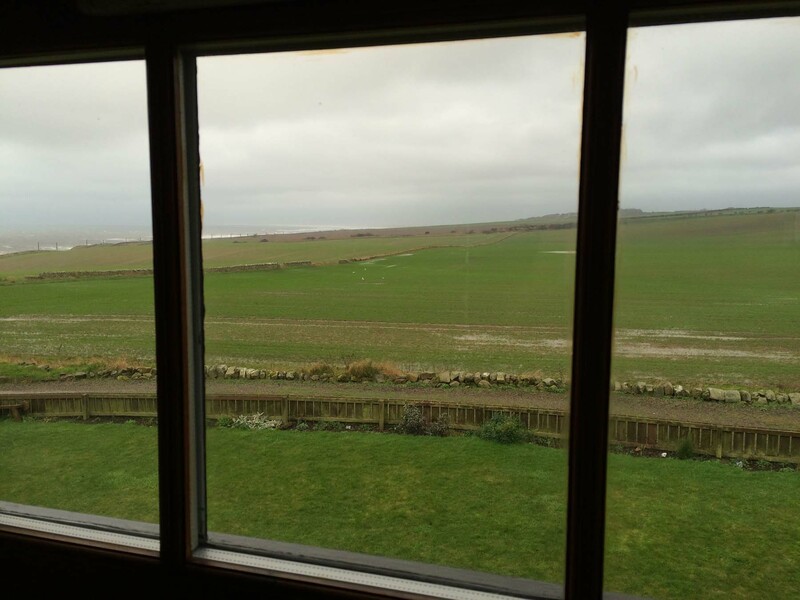 Lots of plants won’t grow here – it’s too salty, too windy, too cold. But poppies flourish, and best of all, they self-seed. They grow where they will, not just where I choose. Don’t they adorn the view so very well … Bottom middle: In the turmoil of family events earlier this year, two little cats, Eggy and Ilsa, found themselves needing a new home – so they came to Seaview! And look how these little smilers love it here! These little London softies have become Northumbrian toughies. They’re good at mousing, chasing the neighbours’ cats, exploring their territory, and finding the comfiest places in the house to sleep (usually some special fabrics I have carefully laid out). Bottom left: Nothing says Seaview to me as much as the big skies with their endlessly-changing weather stories. Through the winter months, we are privileged to watch the sunrise as it moves over the south-eastern horizon. So often it is explosively dramatic and exciting. Perhaps best of all, the sun doesn’t rise until a decent time (8.38 as I write on 31st December), so I don’t sleep through it … You never tire of these skies. Middle right: On the 23rd June 2016, Great Britain voted in a referendum on their European Union membership – and we all now know the result. 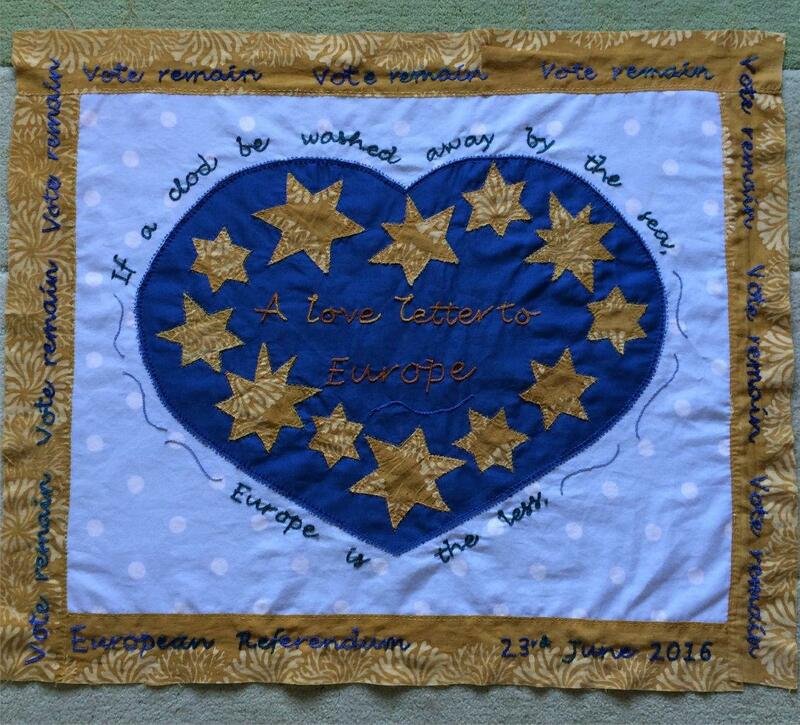 In the days leading up to this referendum, those of us who hoped to stay in the European Union became increasingly worried about the result – as indeed there was good cause – and I was inspired to stitch my Love letter to Europe, incorporating some lines from John Donne’s poem No man is an island. Embroidery isn’t really my thing, so this was a textile experiment for me. It wasn’t, of course, an earth-shaking contribution – really rather feeble – but it was very comforting to stitch at the time. Now it hangs up our stairs, and it speaks to me of our continuing membership of Europe, even if we lose the membership of the European Union. 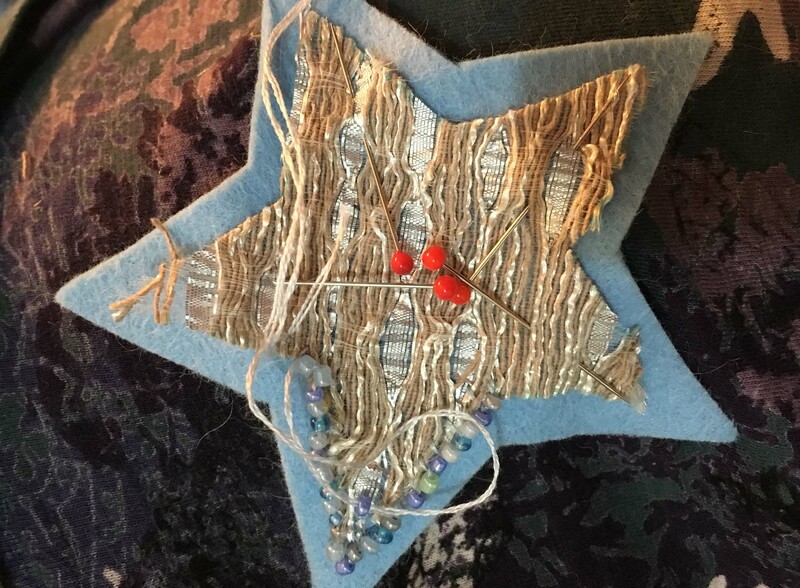 Centre: We saw this little 18th century ladies patch box on display at Traquair House – a very happy daytrip to a most interesting place to celebrate our 25th wedding anniversary. So there are lots of things bound up in this picture for me: my very happy marriage to Stephen, the pleasures we have out and about exploring this beautiful part of the world, and above all else it speaks of hope. More than anything else in these unsettled times, the message of this little box comes back to me, and I find in it great, great comfort. At some time in its history, it must have given hope to another person. Now again, it is holding a hand out to a dodgy future. Goodness knows what I will be writing at the end of 2017. But hope isn’t a bad travelling companion. So thank you for your company on the journey through 2016, and may you all be sustained by hope in whatever comes your way through the next year. Happy New Year! 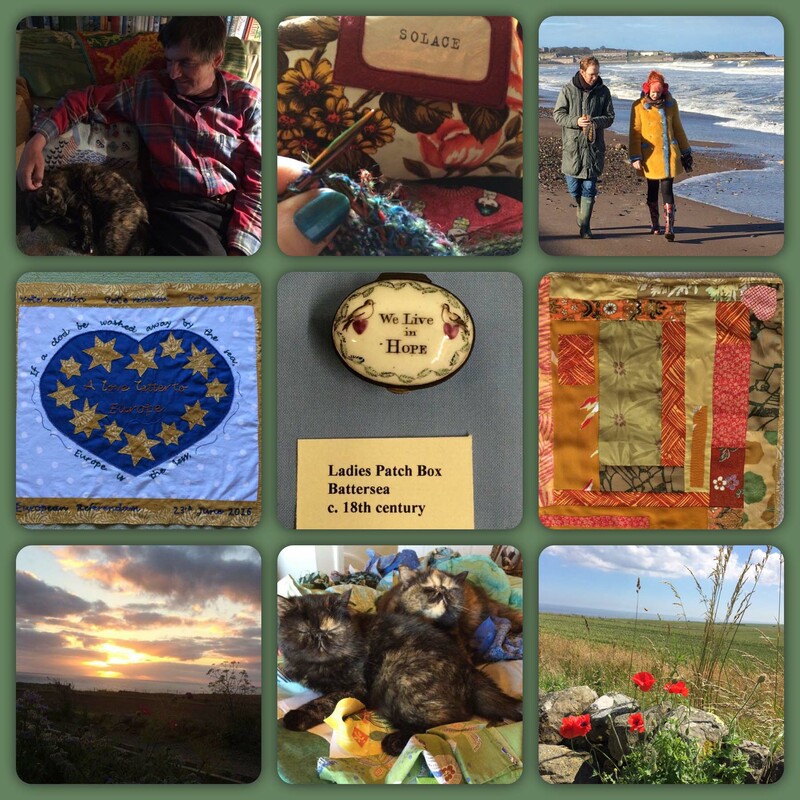 Posted on December 31, 2016 December 31, 2016 Author kaydeerougeCategories Crafts, embroidery, Gardening, History, knitting, My family, Our Seaview home, sewing, Walks and expeditions, WeatherTags bestofnine2016, Eggy, GiveWraps, Ilsa, Love letter to Europe, Poe, poppies, Referendum, Seaview, Solace bag, sunrise, Traquair House16 Comments on Goodbye 2016! December knocked me flat. I feel quite ashamed to admit this because in retirement we enjoy a leisurely and simple Christmas. 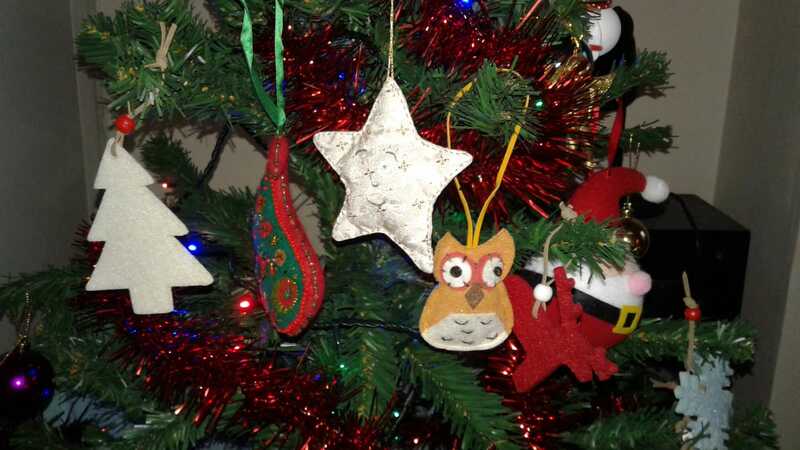 No longer are there small children to delight and exhaust, no longer are we heavily involved with parish church festivities, and no longer do we have working schedules that get more and more chaotic as Christmas approaches. I look back on those times with amazement – and wonder how we did it all? 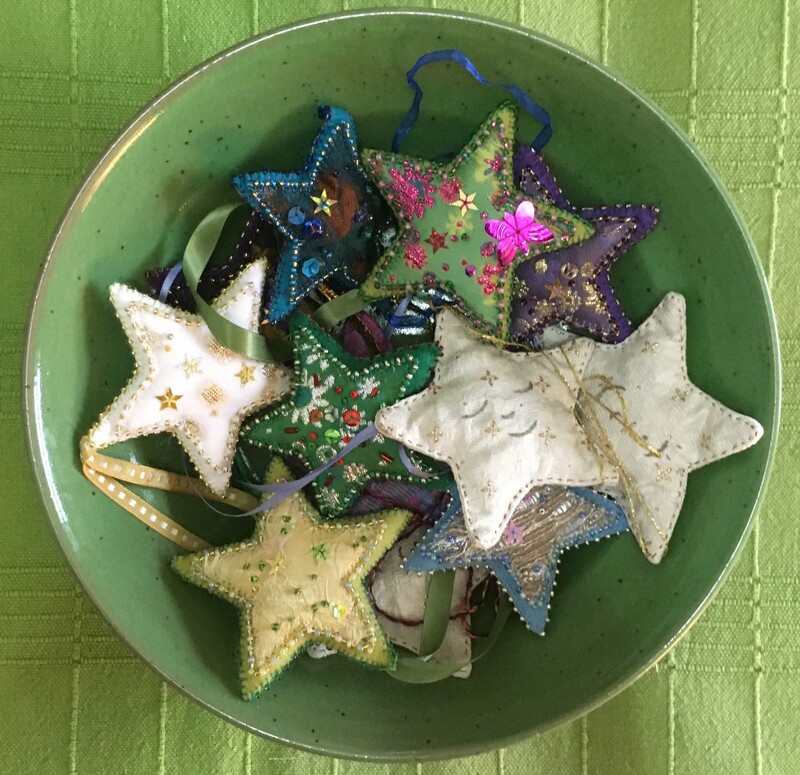 This year, it is only now – as Twelfth Night, Epiphany, the end of the Christmas festival, approaches – that I have recovered sufficient mojo to look back on December reflectively. Of course lots happened. 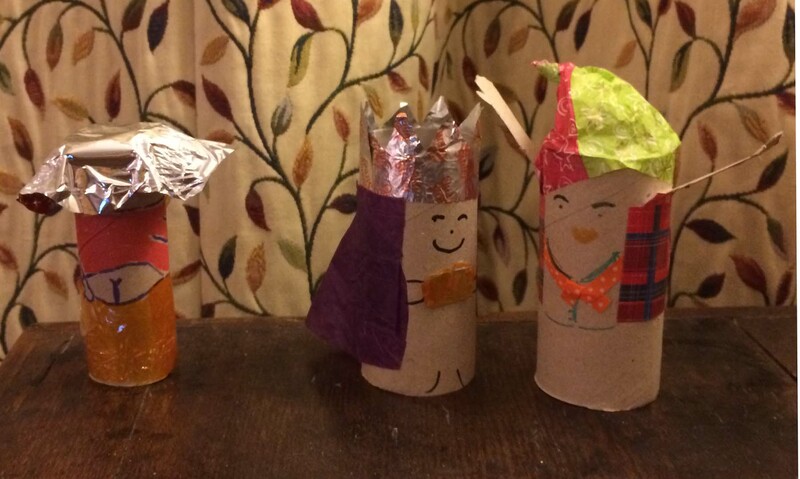 But for the purposes of this blogpost, I’m going to concentrate on homemade Christmas gifts. 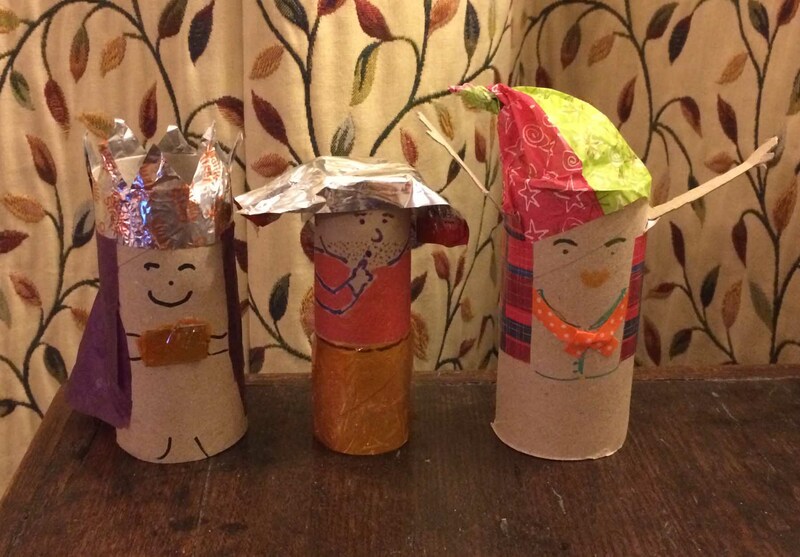 These made me very happy – and I hope they gave the recipients pleasure too. 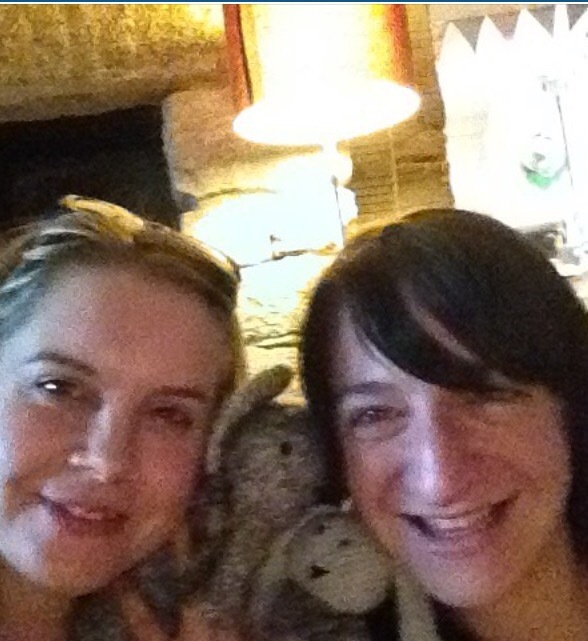 I just love the small furry animals devised by Kerry Lord, the talented brains behind the Toft alpaca story. 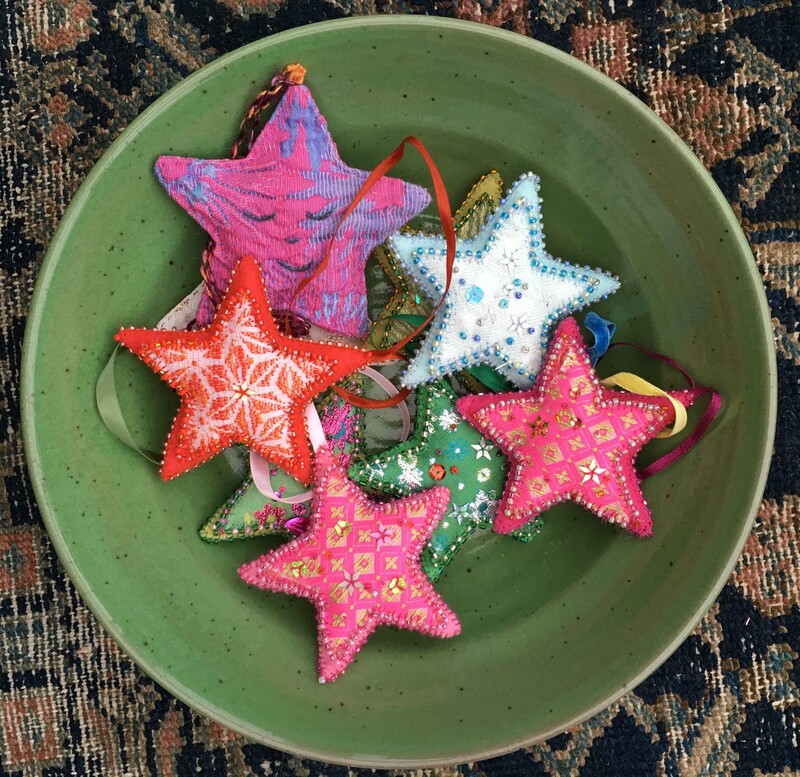 They are so cute – so quirky – with so much character – surely, I thought, they would be acceptable gifts to our very grown-up children? 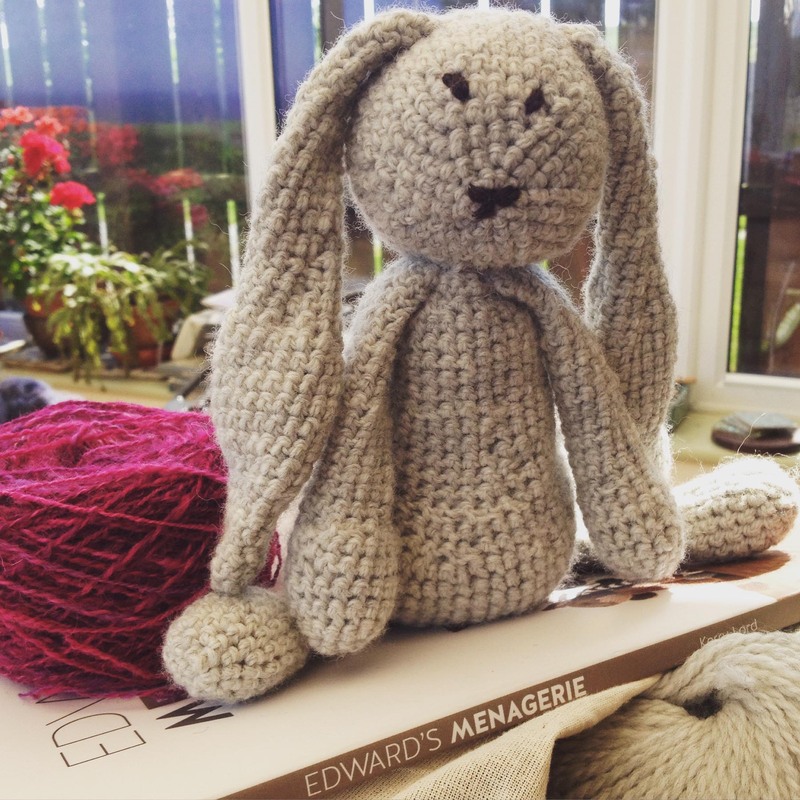 The first Toft creature I made – a bunny – was crocheted using Toft’s own alpaca yarn. I’m not a crocheter and found the pattern very hard to master so I was just pleased as punch when I finished her. Isn’t she a sweetie-pie? A wintry day in December found me up in my woolly workroom, with Poe, our cat, putting together some more Toft creatures. I didn’t have enough of the Toft yarn to crochet more creatures, so dug into my stash for some hand-dyed homespun. A single strand of Rowan Kidsilk Haze added to homespun gave the Toft creatures a soft furry finish. The trickiest part to making these Toft creatures is the stuffing – they need to be tactically understuffed. I’m getting better at this – not easy. But it is the sagginess that adds to the character. Each creature also has a little bag of “ballast” sewn into their belly to help provide core stability. 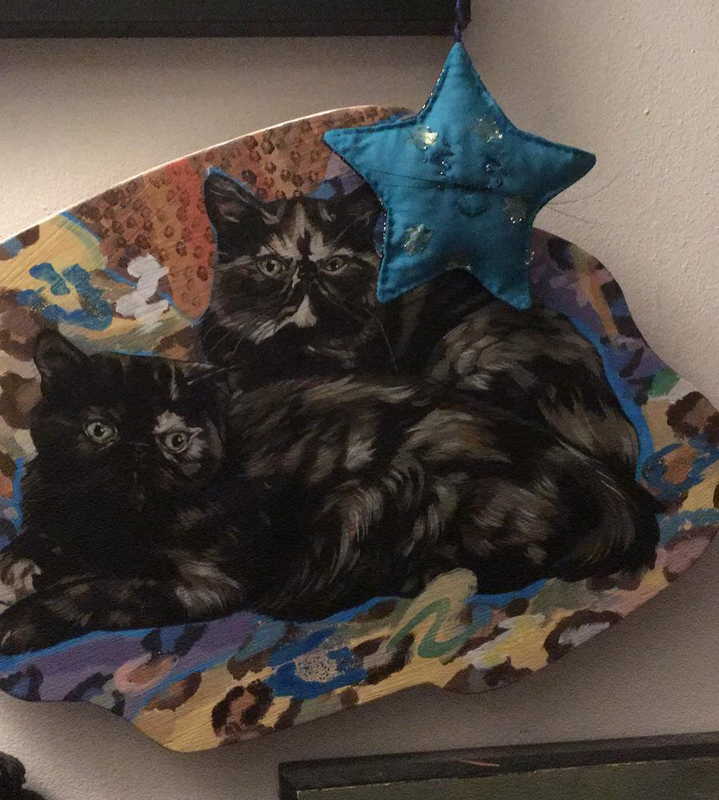 These two were meant to be Siamese cats but they do not look at all feline to me. No, they are foxes, surely – little Fennec Foxes, I think! Here’s my Toft gang before they set off bearing Christmas love and good wishes. Most of them went to new homes, but three little ones (the darker ones – my earlier attempts) keep me company and stay here. As it is cold and wintry, they all got stripey scarves to keep them warm on their travels. Some Toft creatures found themselves making new furry friends in their new homes … Others got Christmas cuddles when they arrived … Hats were my other focus this Christmas. 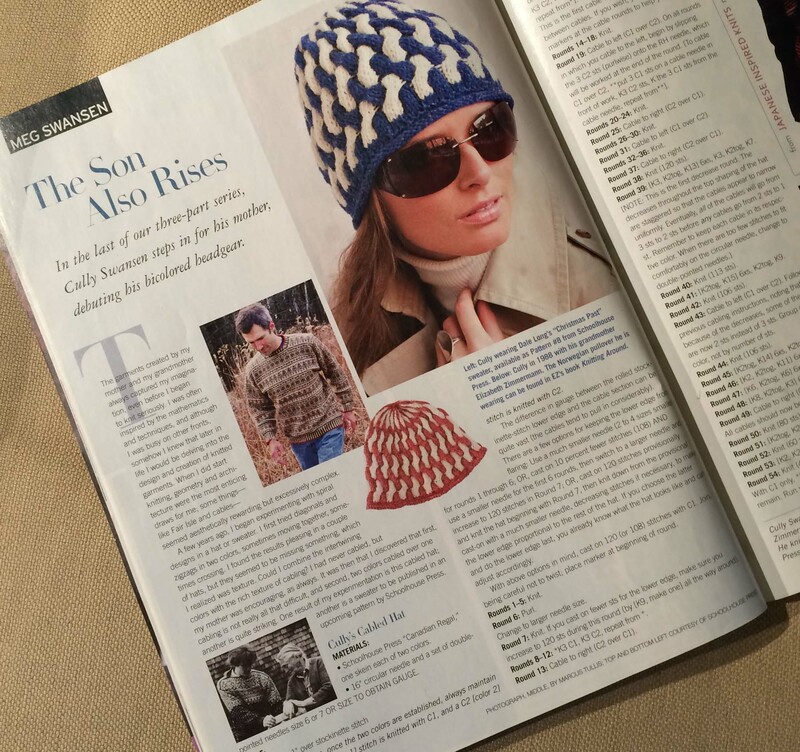 Browsing through old Designer Knitting magazines, I found this two-colour cabled hat designed by Cully Swansen in the Winter 2009/10 issue. 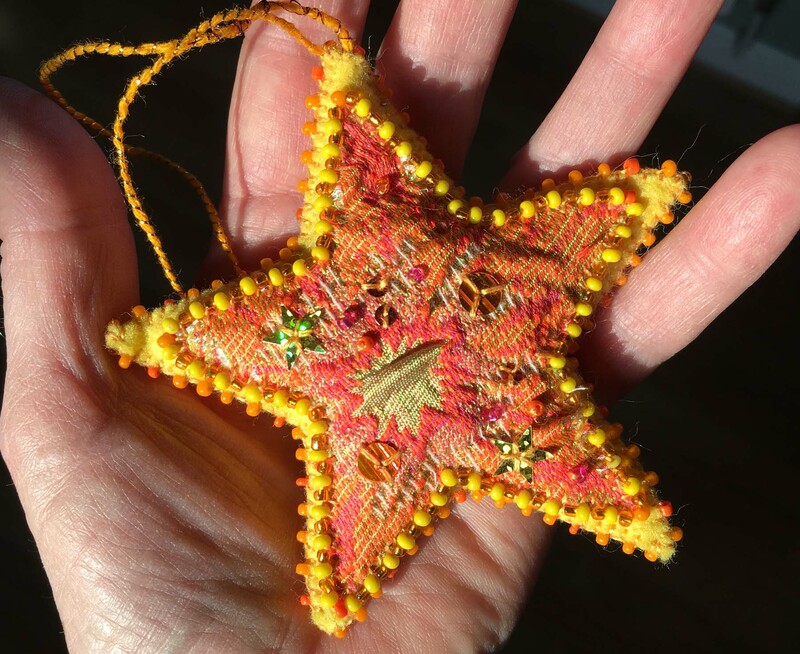 Just a great pattern – and excellent for using up smaller amounts of yarn. 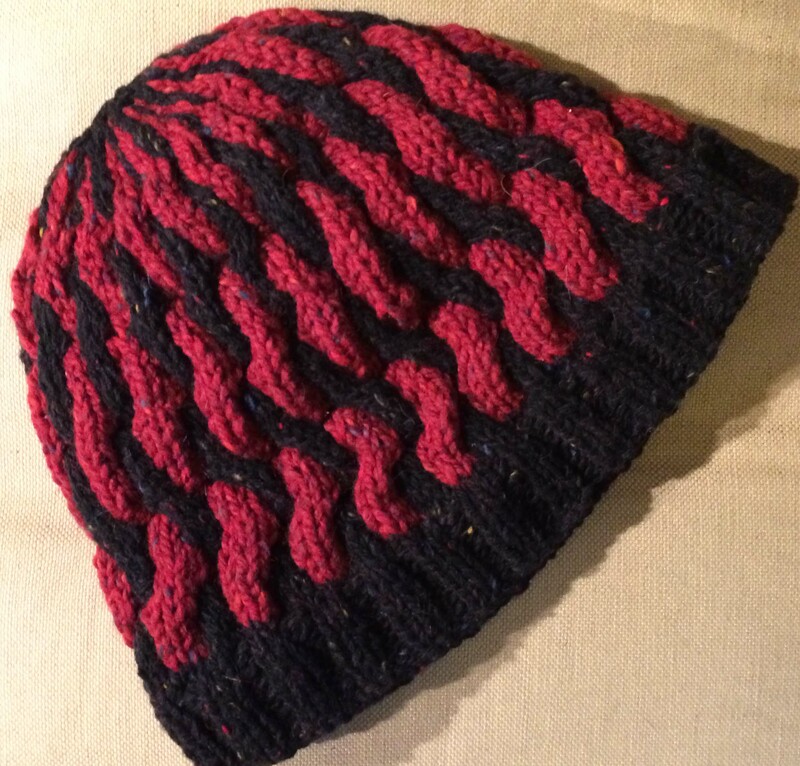 I changed the pattern slightly, adding a wide-ribbed headband in place of the garter stitch of the original pattern. All the pompoms are alpaca and were purchased from the Toft alpaca shop – I can’t tell you how lovely they are: soft and furry and very fluffy. My first attempt was this green and white hat. The white is the leftover yarn from the Toft bunny above, and the green is homespun mixed fibres yarn (wool, silk, and mohair). I picked up a small ball of what I think is Noro Silk Garden in a charity shop and put a strand of that with my homespun. This added to the variegated effect and the softness. I was really pleased with the green and white hat – so made another. It took me a long time to work out the colours. I knew I wanted grey – but what to put with it. I tried red – no, too obvious. But khaki golden yellow? Hmm – yes, that looks very promising. I think its what is called Grellow in knitting circles these days. The yellow is left over Rowan alpaca colour (a gorgeous soft silky yarn) and the grey is two strands made up of Lang Donegal and another grey yarn (name and details lost – oh dear, system slipping). 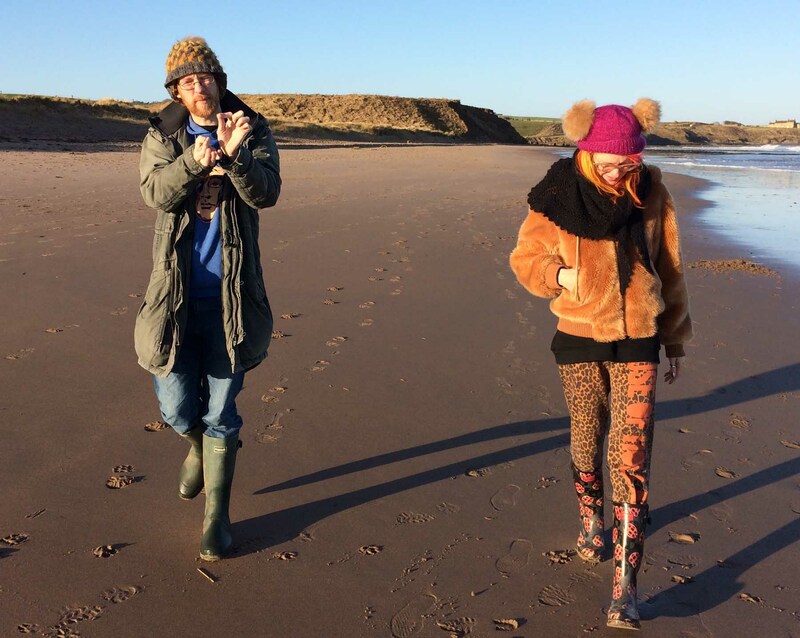 We had perfect weather over the Christmas period for the wearing – and modelling – of the new hats. I made three of these hats as Christmas presents. This last is more a beanie because that’s what my husband wanted. 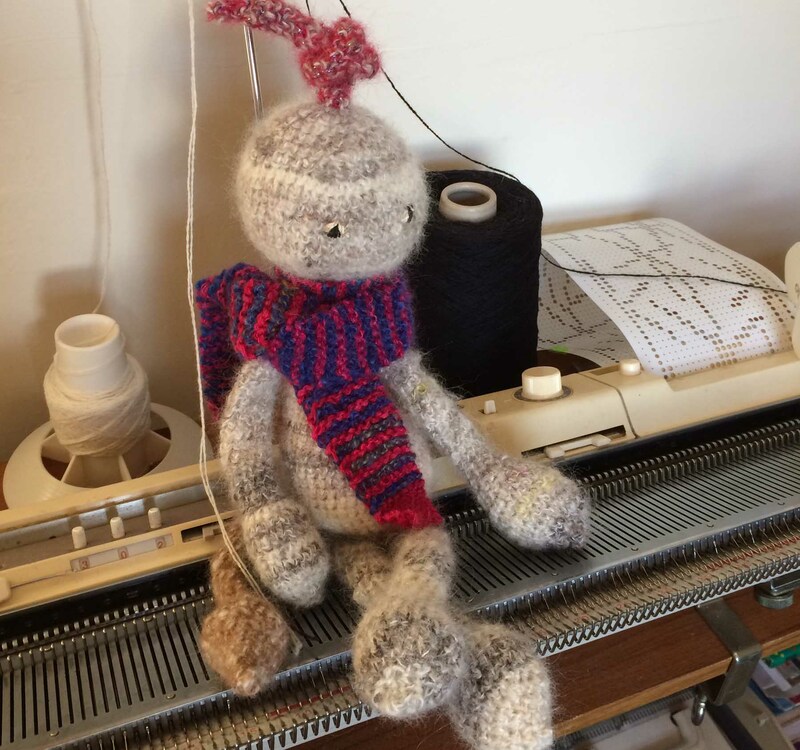 He didn’t think a pompom was for him … (The black is Debbie Bliss Fine Donegal combined with my own homespun, and the name and origins of the red scrap is lost in history – but it is a lovely thick flecked yarn.) And now I’m making one for myself. I found it very difficult to restrict myself to two colours so with my own hat, I’ve allowed myself to use three colours. I know it doesn’t show off the clean lines of the cabling, but the colours work well together. One of the yarns is a beautiful hand spun merino yarn my husband brought back from South Uist. It’s red and orange and brown and yellow – Uist Landscapes – Peat Stack is the name the spinner, Denise Bridge, has given it. So evocative. The variegation confuses the cable pattern further, of course, but I don’t think that matters. The homespun merino is like little flames in the green and brown, isn’t it? (The green is a Rowan Tweed, and the brown is my own homespun combined with a strand of dark purple Rowan Kidsilk Haze.) My son asked for the present we all want – more time. And this is what my clever Stephen gave him – why, of course, let’s up the hours in a day from twelve to thirteen! That’s 8.3% more time a day … Look how pleased my Jammy is! The secret of this time cook-up lies with Stephen, but I can let you know that there were cheap Homebase clocks and Excel broadsheets involved … There were a couple of new GiveWraps for these presents. Both went to cat-loving ladies. I think these Japanese ladies work very well with the cats – for some reason … And this GiveWrap went to a lady who loves cats and Mexican Day of the Dead images and Moomins – and those scratchy cats of Alexander Henry’s keep up on cropping up everywhere … Even an old child’s pillowcase has started a new life as a GiveWrap … happy memories … I was given the most generous of gifts – gifts to feed inspiration. 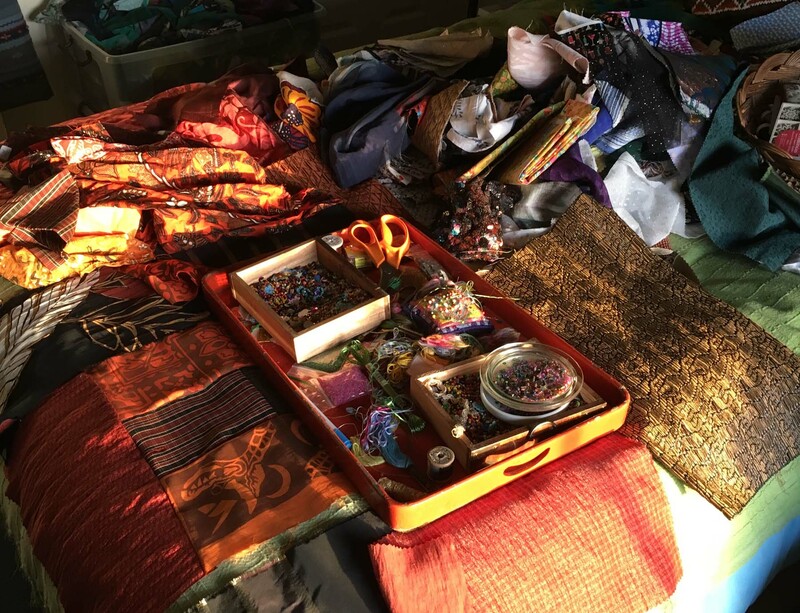 There were books and fabrics and yarns …. 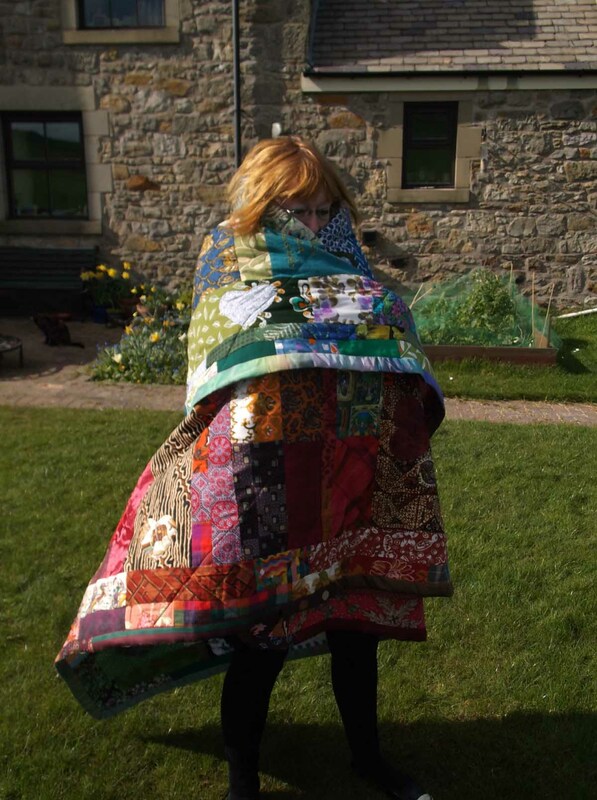 Perhaps you read my blogpost about dyeing fleece, and my undisciplined methods? 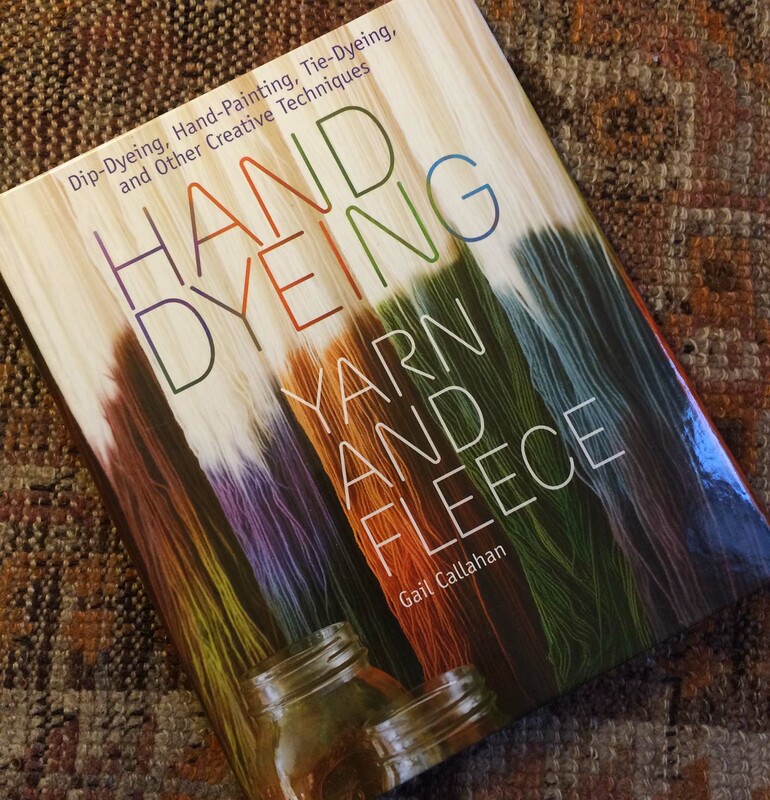 This year I am going to learn how to dye properly – thank you, Gail Callahan! 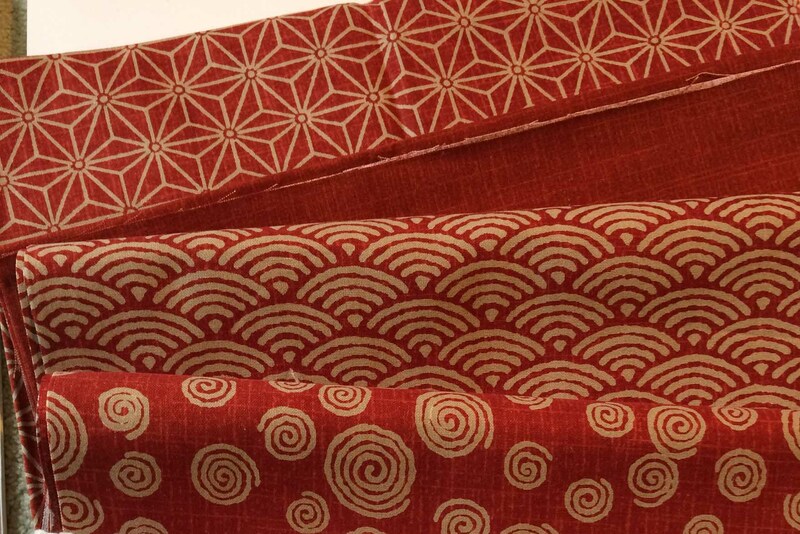 These wonderful Japanese fabrics were a gift from my daughter. They are such an amazing vibrant colour – and the patterns! 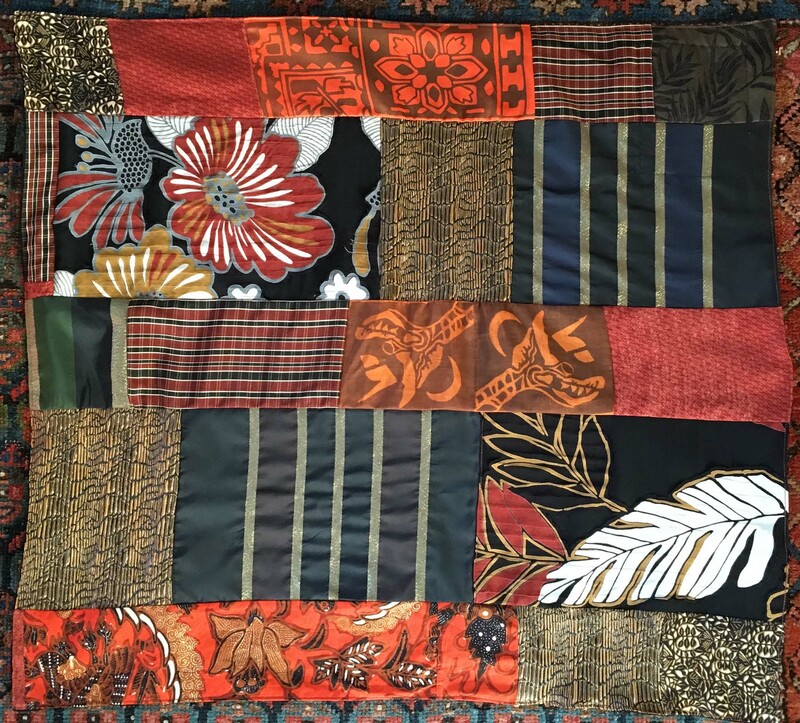 I sort of have the seeds of an idea for another quilt – and perhaps these would be part of that … More fabrics from Stephen. 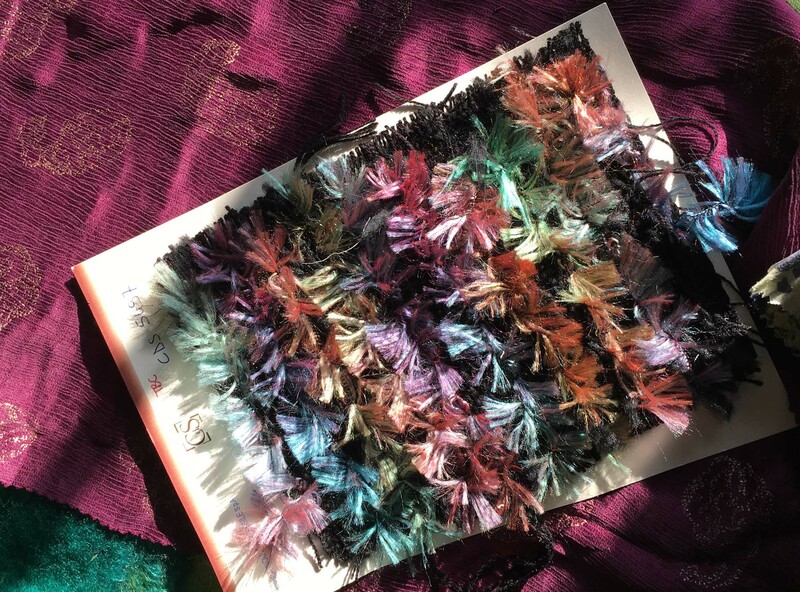 This is an entire sari – silk, of course. It is vintage – I guess that means somebody threw it out? It is very soft, both in texture and in colour, and I will not be throwing it out any time soon. There is enough material to make a full length dress, but my seventies days are over, and I’ll probably be making a tunic to wear over leggings. Gorgeous to wear in the summer. 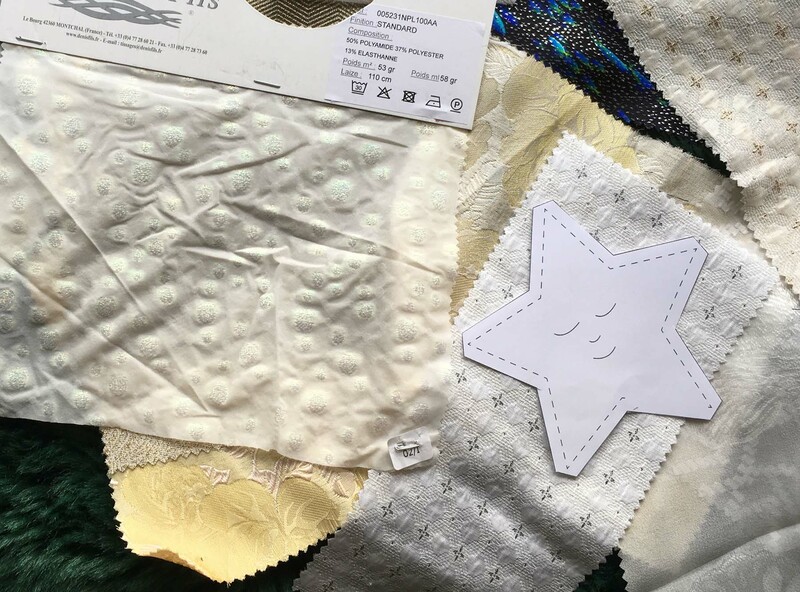 From another Ebay website, Stephen got these silk sari scraps. 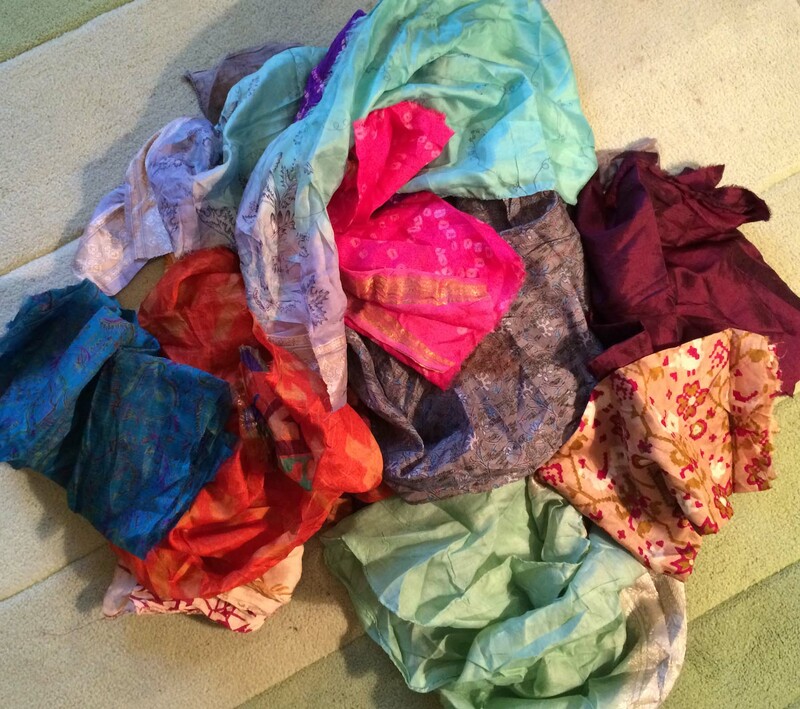 These are the good parts from old, damaged and worn-out saris. They will make some beautiful GiveWraps. Lots and lots of inspiration there. 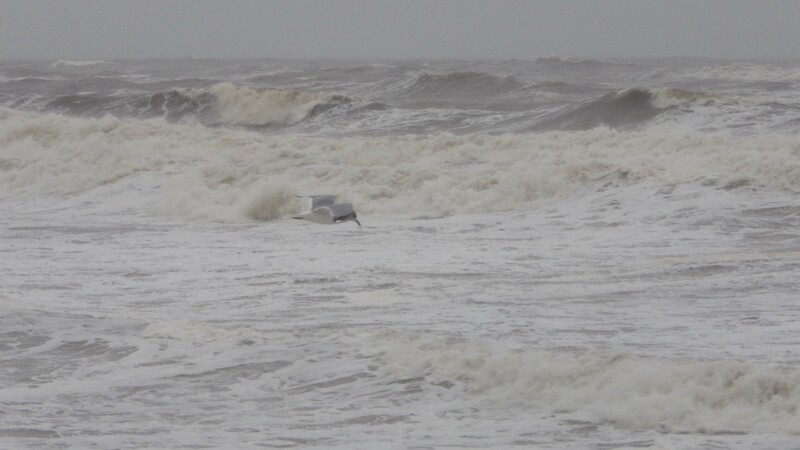 Now the days are grey and dark, windy (very) and miserable. I learn from a Brittany instagrammer that the Celts call this time Les Mois Noirs. Apt description indeed. 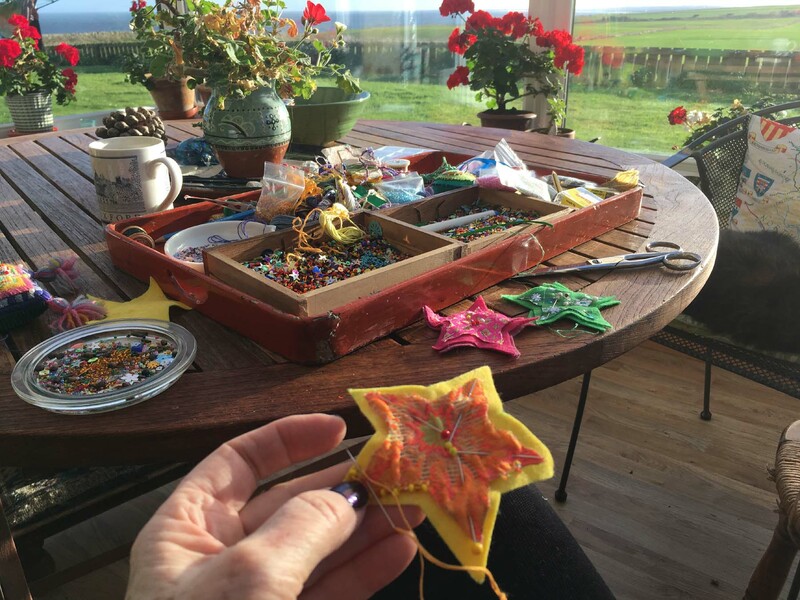 We look out on wet puddled fields … and wild seas … Only the seagulls seem not to care … Our lane is eroding as water forces new pathways … Time to put all the lights on so that I can actually see some colour, and get playing with all this gorgeous new stuff! Posted on January 6, 2016 January 6, 2016 Author kaydeerougeCategories Crafts, dyeing, knitting, My family, Our Seaview home, sewing, spinning, WeatherTags cabled knitting, Christmas, crochet, Cully Swansen, Denise Bridge, Epiphany, Fennec Foxes, Gail Callahan, gift of time, GiveWraps, homespun yarn, Indian sari material, Japanese fabrics, Kerry Lord, Les Mois Noirs, Northumberland, Poe, sari, seaviews, Toft alpaca, Twelfth Night, weather8 Comments on Christmas gifts – and wintry weather! This is going to be an indulgent post! I have been making lots of GiveWraps. It’s the birthday season in my family and Christmas is in the offing, so there’s every reason to have a little play with colour, yarns and fabric. 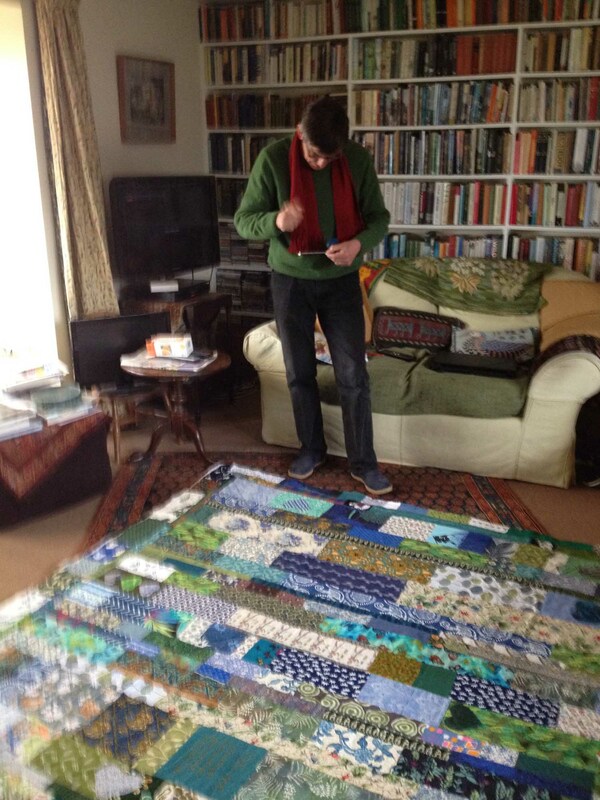 Given a nice sunny day (so the light is good in my little Woolly Room), I went into production mode. If there is time, I like to make GiveWraps with particular people in mind. It’s my daughter’s birthday at the end of November and last year I made her a very special GiveWrap using bits of animal print fur fabric scraps left over from her teenage sewing experiments. This year I wanted to do something different. 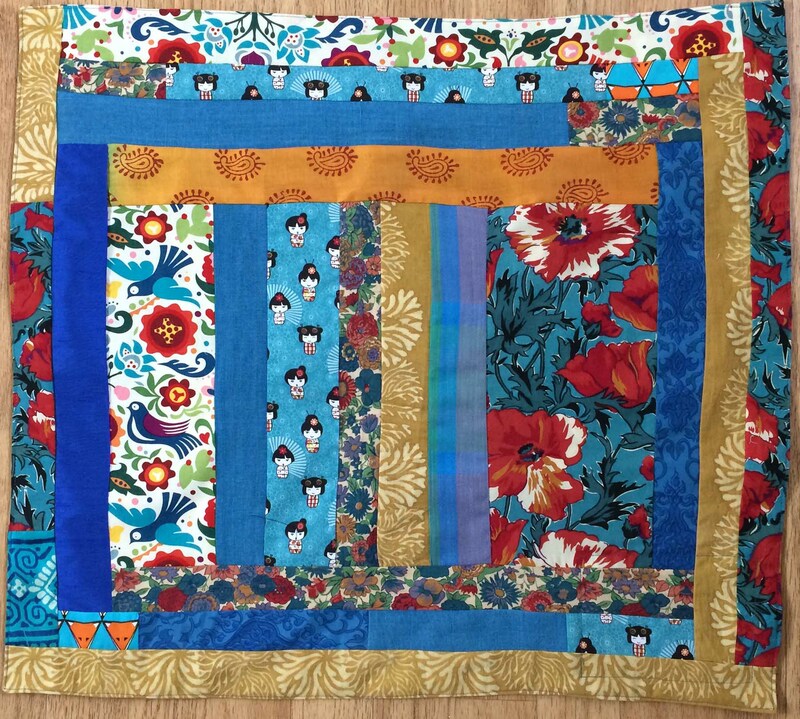 I’ve got some Very Hungry Caterpillar fabric (always a family favourite) – what about that? 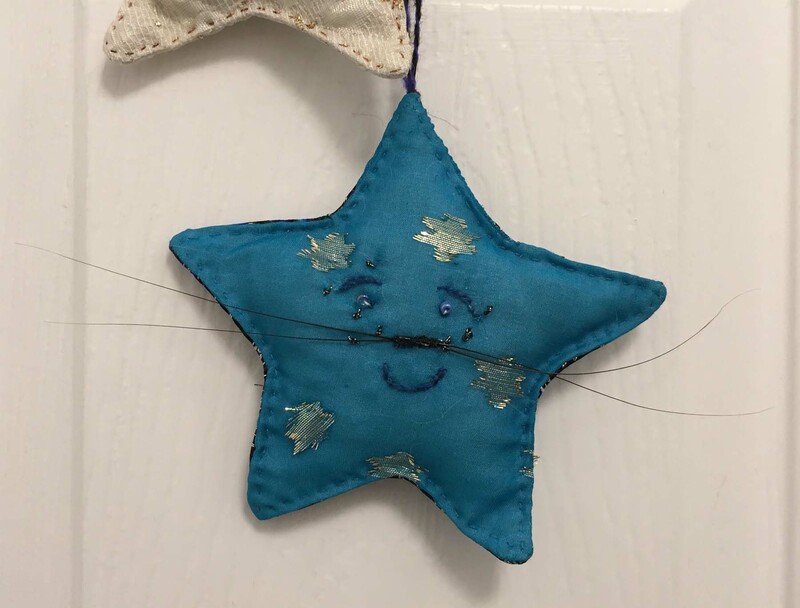 The caterpillars are interspersed with familiar scraps: the grass-green chintz was left over from blinds I made in our old house, the pink and blue flower fabric was used for curtains in her bedroom ….. She likes both cats and the designer Alexander Henry. 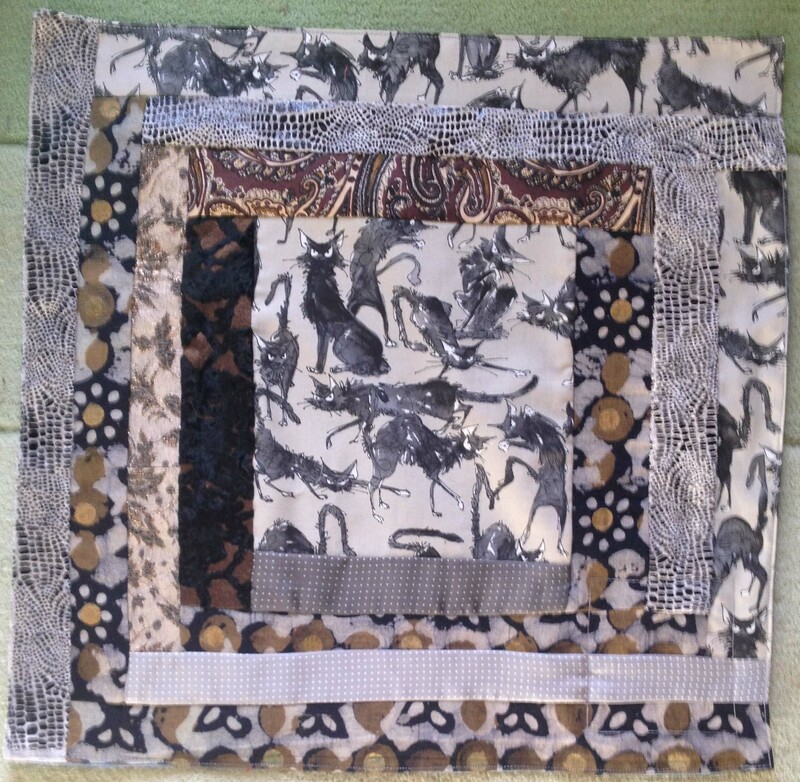 Happily these two likes come together with some of his wild and wonderful scratchy cat fabric. I think these cats are just wicked! I have some interesting printed scraps from my cousin, Polly (with whom I set out on this GiveWrap adventure). 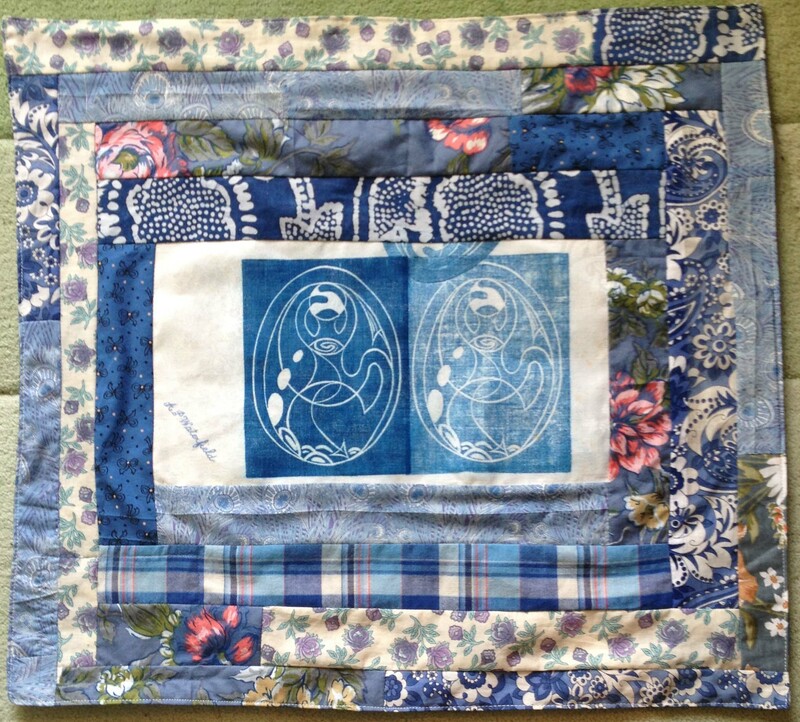 Here is her Microcosm enclosed print in the centre of this blue GiveWrap. 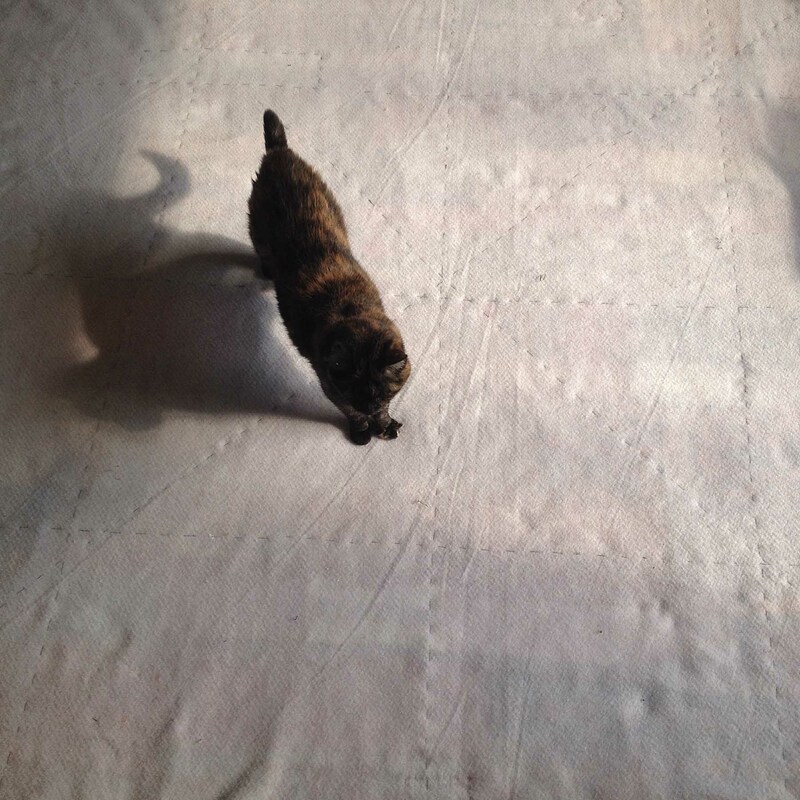 She has printed it on an old tablecloth that once belonged to our grandfather. You can see his name embroidered on the plain linen. I’ve kept it in partly because it is our shared story, and partly because it is an example of beautiful craftsmanship in itself. I had a few tiny scraps of Microcosm enclosed left over and wanted to emphasise the facial aspects of the print so I put them with these pieces from my old and very worn-out yukata. I love these Japanese ladies! 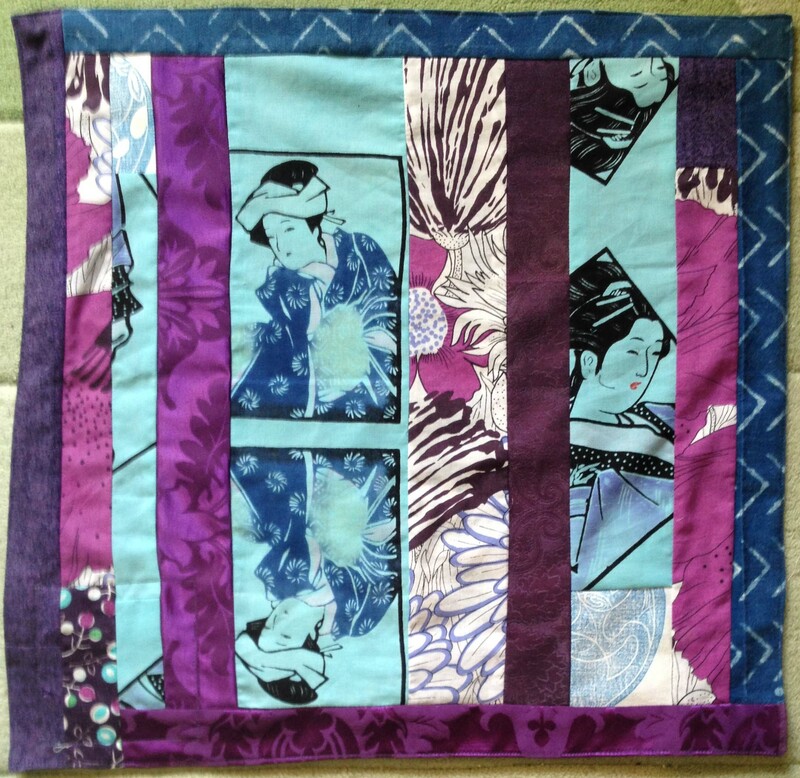 The yukata was originally white – and a reject from my mother. 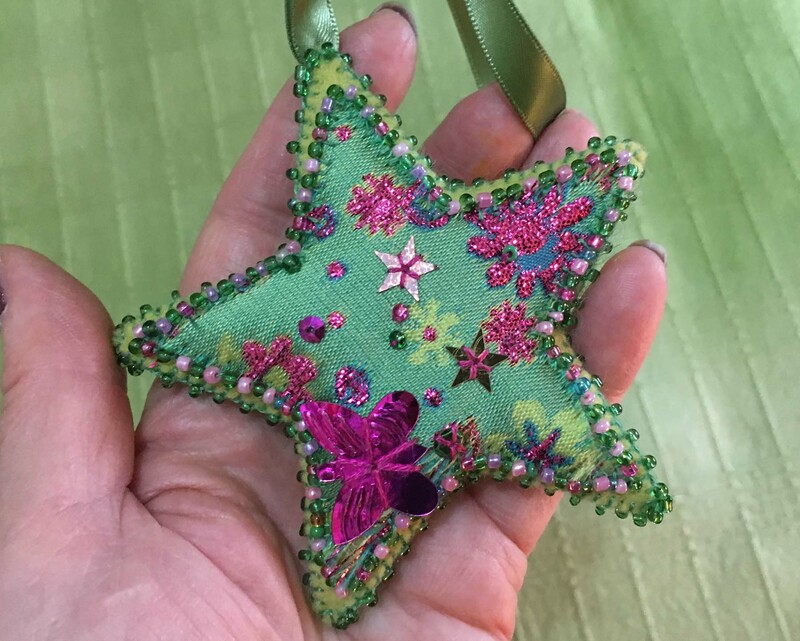 I dyed it turquoise – a great success – and wore it and wore it and patched it and patched it. Eventually the time came to admit defeat – but these lovely ladies have found a new life in my GiveWraps, and don’t they work well with the purple?! There’s a faintly mauve tone in their kimonos which is why it all works together so well. There are more people in this print of Polly’s. The figures on the right are her as a little girl beside her mother. I thought long and hard about how to make this GiveWrap. I definitely wanted to emphasise the vertical lines so eventually settled on tree and leaf prints. It seemed to be important to place the print on the right so that the figures could look over the GiveWrap – and Polly’s fish print just snuck in on the left. Now for some dragons – but what on earth was I going to put with them? 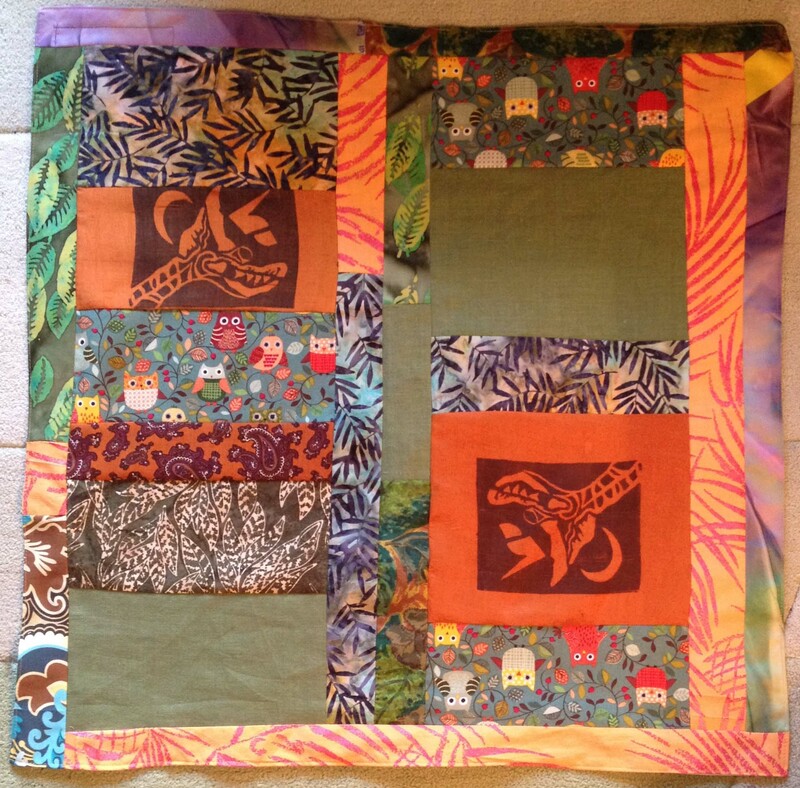 I knew that I wanted to pick out the orange of Polly’s dragon prints and contrast it with green. Then, by chance, I came across this owl fabric with its orangey-reddy-brown owls on a soft leafy green background – just perfect! 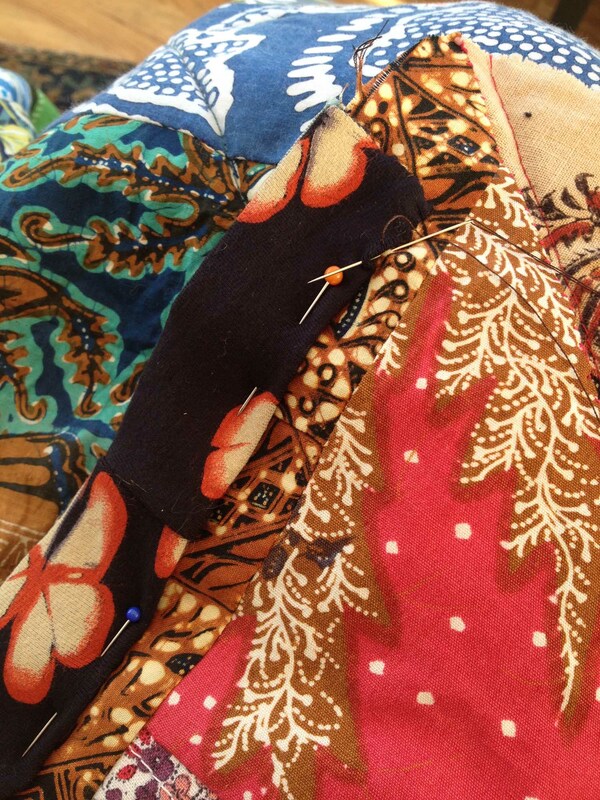 Lots more leafy fabrics in the mix as well. I deliberately set the dragons in two columns “facing” each other and “upside down” to each other (so to speak). It’s a trick borrowed from the yukata ladies above that I particularly like. 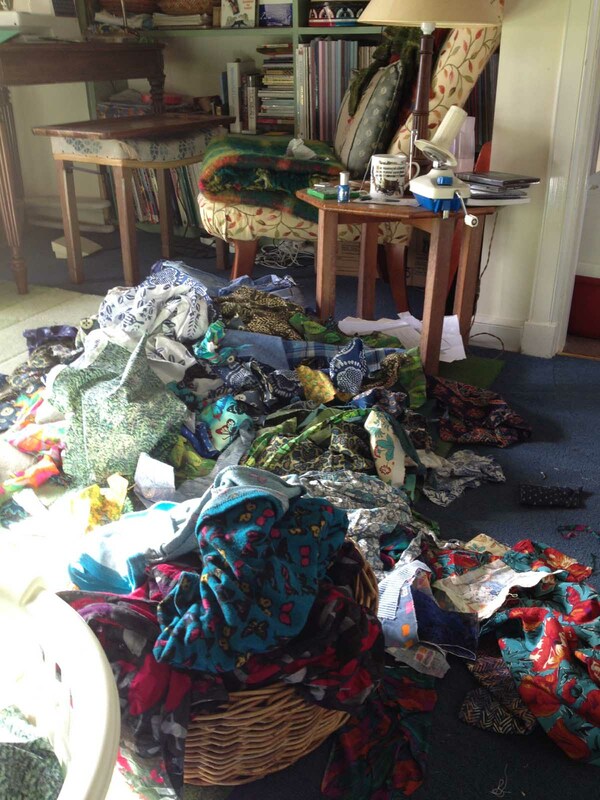 There were still more of Polly’s printed dragon scraps. These dragons have been printed on a very fine gold silk, and – don’t ask me why! 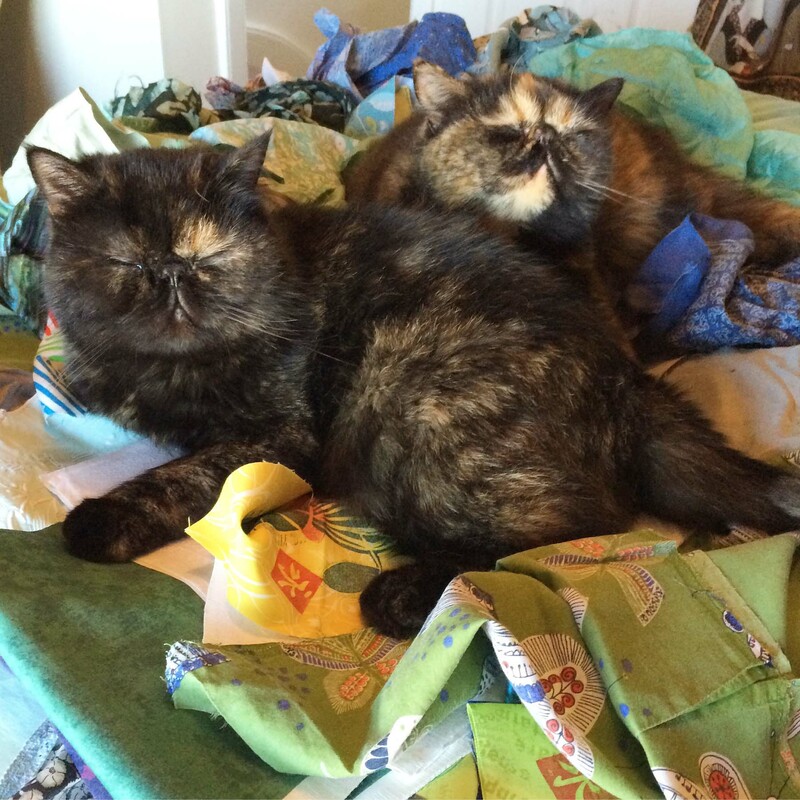 – they set themselves in browny-grey fabrics, and then the Alexander Henry scratchy cats just asked to join in! Sorted!! On a roll now, I made yet another GiveWrap I really struggled with this one. 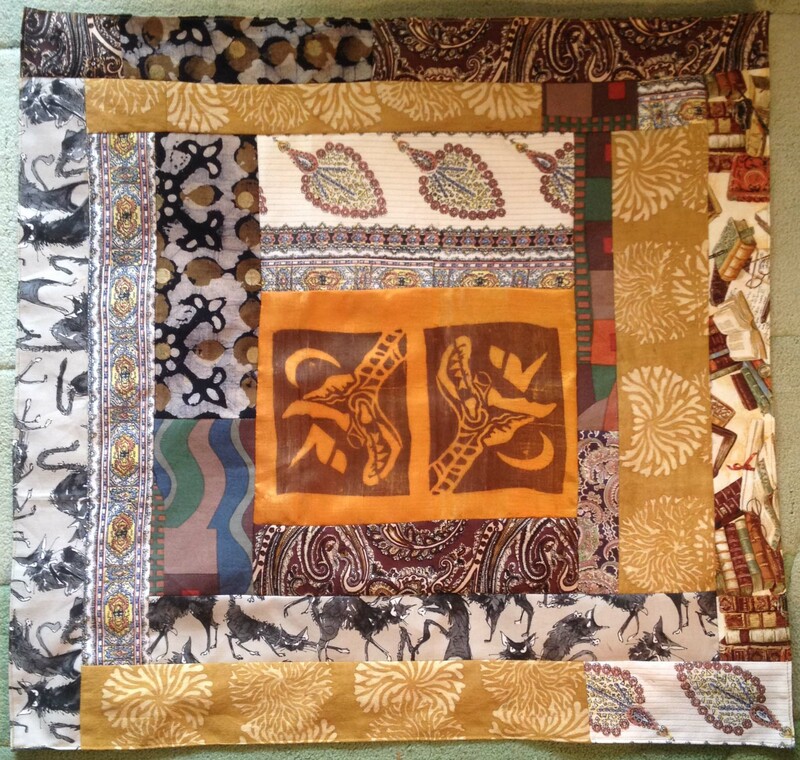 The fabric in the centre is from a very beautiful Indian silk dress of my grandmother’s – alas, perishing. 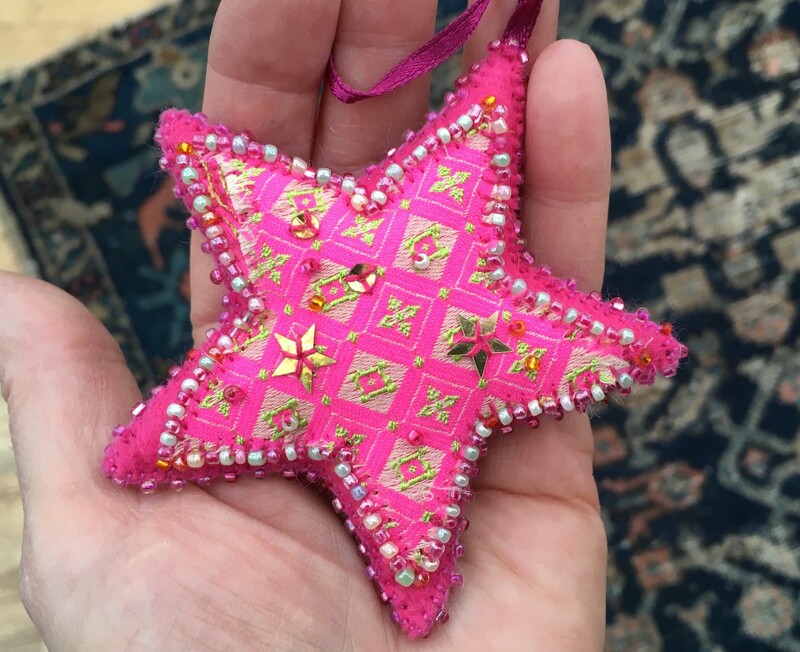 You may just be able to see that the pink flowers are picked out with gold threads – so much work in it. It was a very straight short shift dress – so not a lot of material – and I had no idea what to do with it, except, of course, make a GiveWrap. But I found it a hard challenge to find colours and patterns that married with those delicate colours. 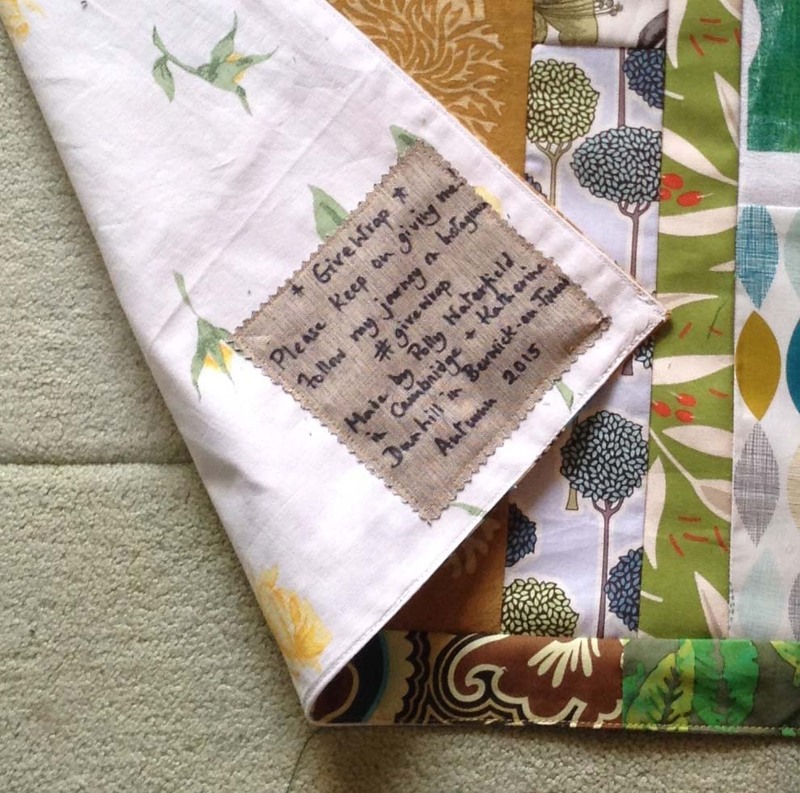 As it turned out, it is a very sentimental GiveWrap, using lots of pieces that have strong associations. The small brown flower print is from the first dress I ever bought myself – in the 60s! 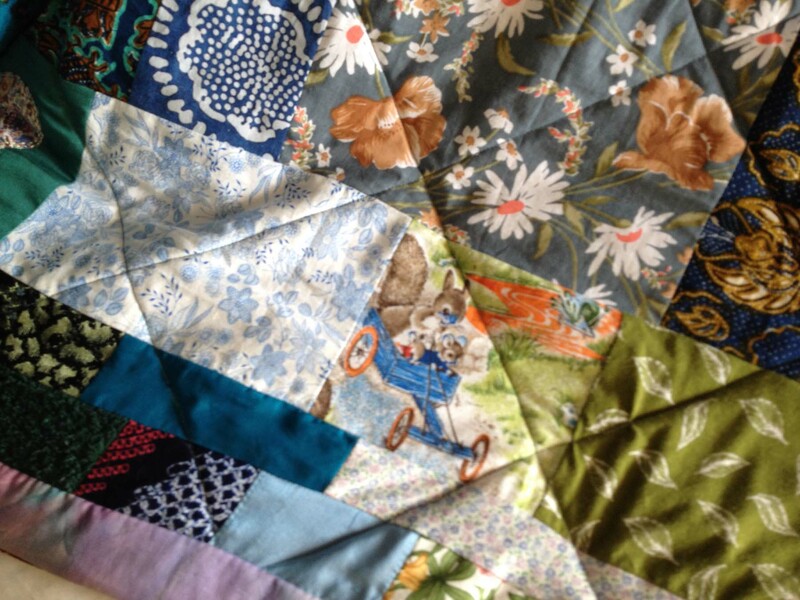 It was kept because my mother loved it – and used it for patchwork. I’ve added strips of the soft brown needlecord that was leftover from a dress I made my little daughter many years ago. How nice to have found a home for these special pieces. But will I ever be able to pass this GiveWrap on? And lastly two knitted GiveWraps which I have been working on by the fireside in the evenings. Here I was using up scraps of knitting wool and some chenille too. These are knitted in linen stitch which gives a pleasing woven effect. 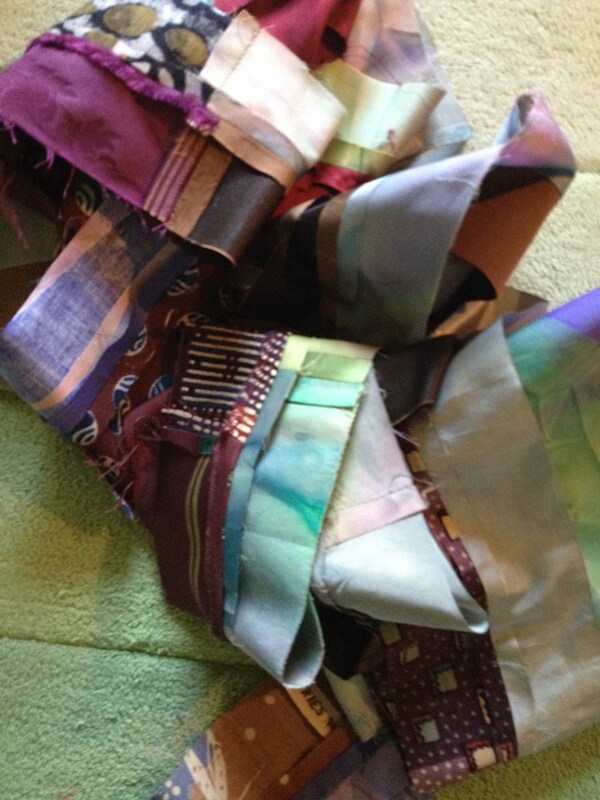 They are such fun to put together – it’s really fabric creation at its most basic. Little odd strands of contrast colour lift the whole. 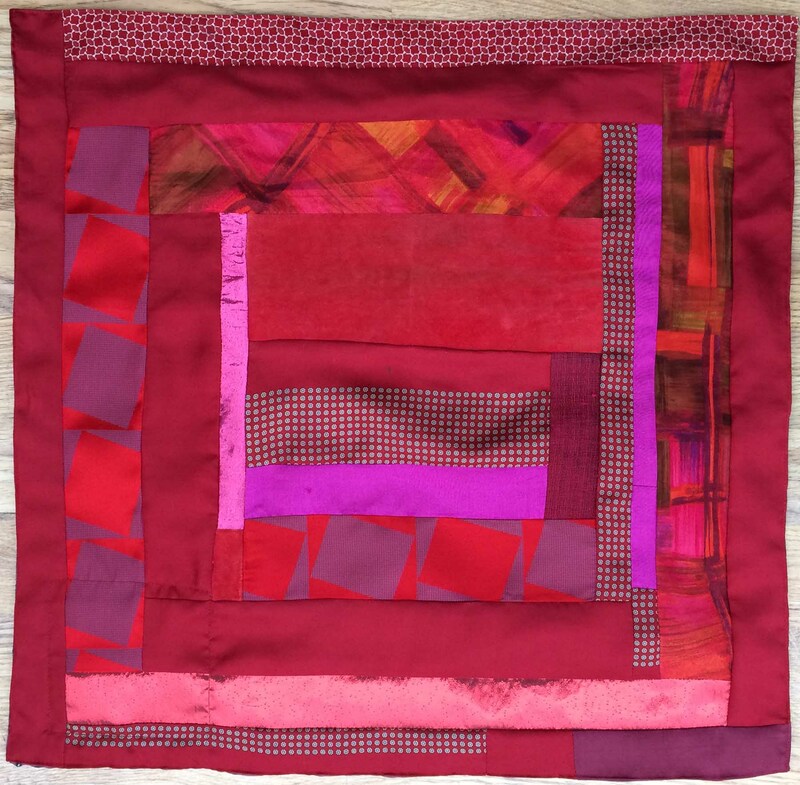 One knitted in reds and pinks …. … and the other has some orange in the mix. 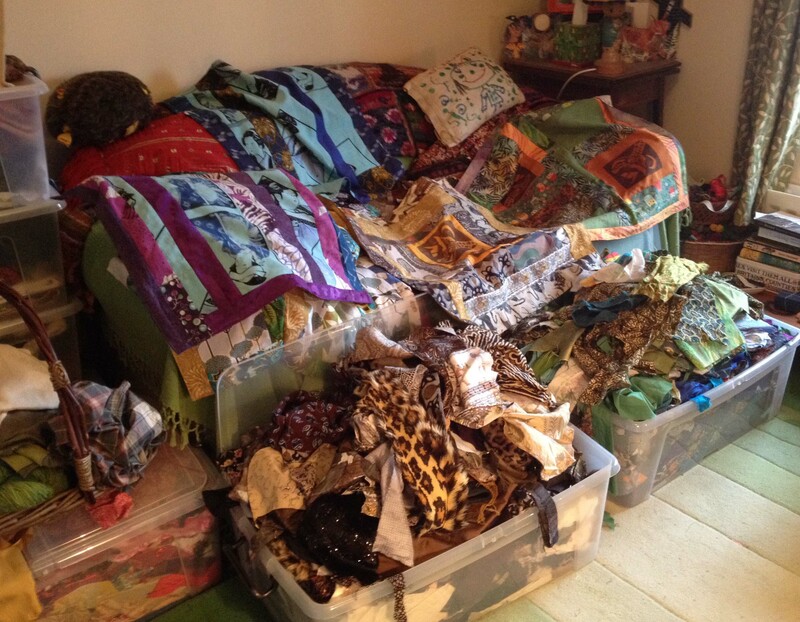 Time to tidy up my little Woolly Room and turn to other projects. It’s a tiny room and I have to be very disciplined as I work. All these GiveWraps have labels on the back. I’ve given up using the computer for labels, finding it too much of a struggle for my printer. However, Anne Wheaton has some helpful advice on printing labels and perhaps when I’m next making GiveWraps, I’ll try one of her methods. 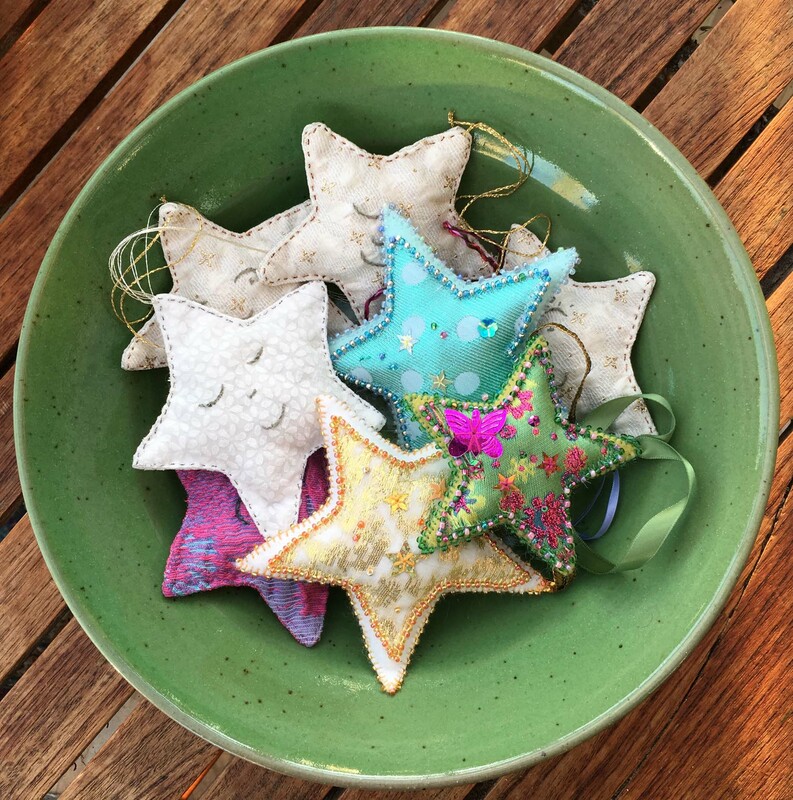 Posted on November 29, 2015 December 6, 2015 Author kaydeerougeCategories dyeing, knitting, My family, Our Seaview home, printing, sewingTags Alexander Henry, GiveWrap, GiveWraps, Polly, Very Hungry Caterpillar, woolly room17 Comments on Yet more GiveWraps! Last year, several things came together for me. 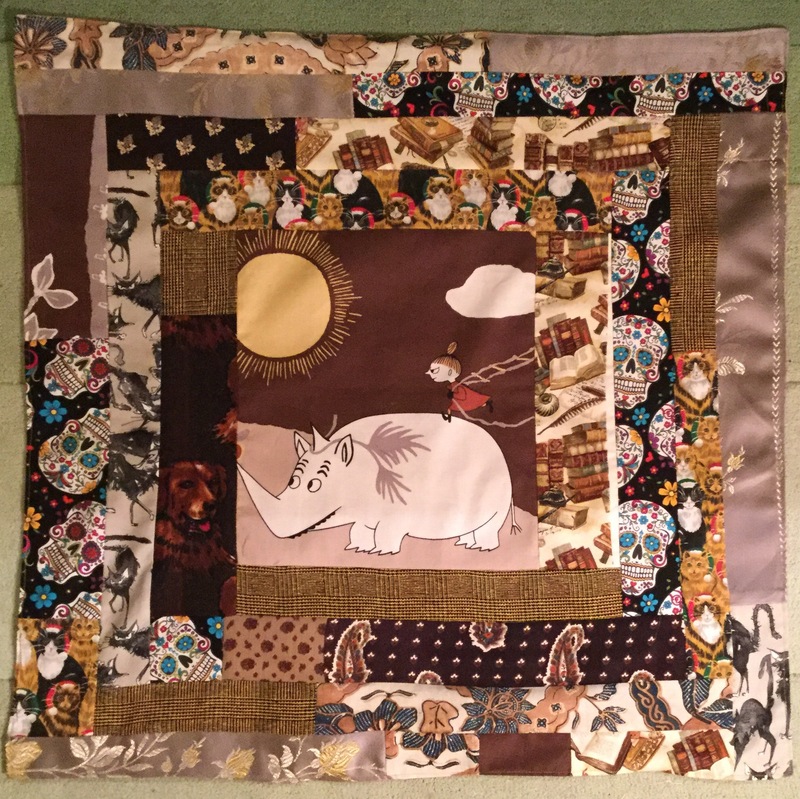 I found myself spending much more time sewing than I had for many years. 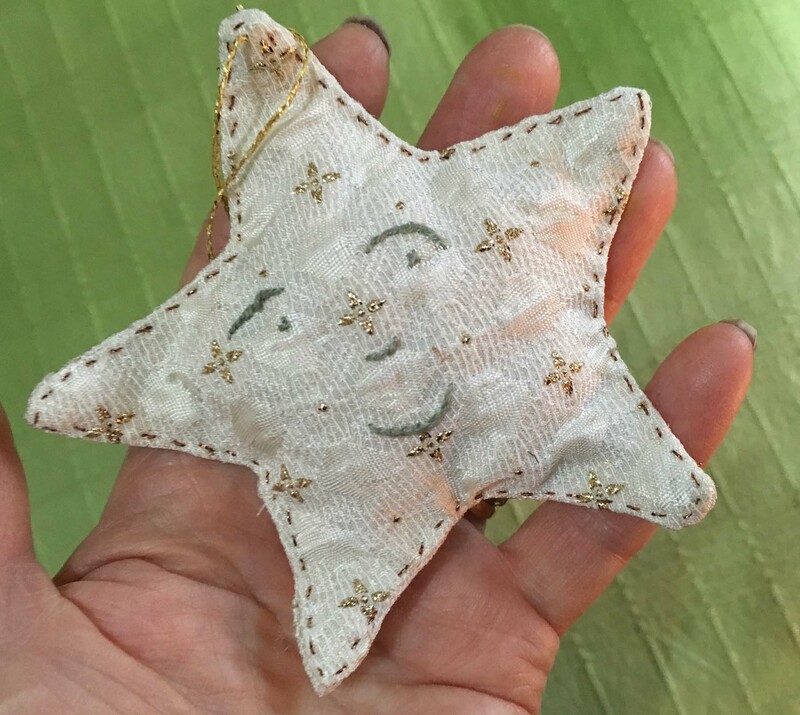 I was inspired by a blogpost I read by Rebecca of Needle and Spindle in which she wrote about the Needleworks Collective and their GiveWrap idea. 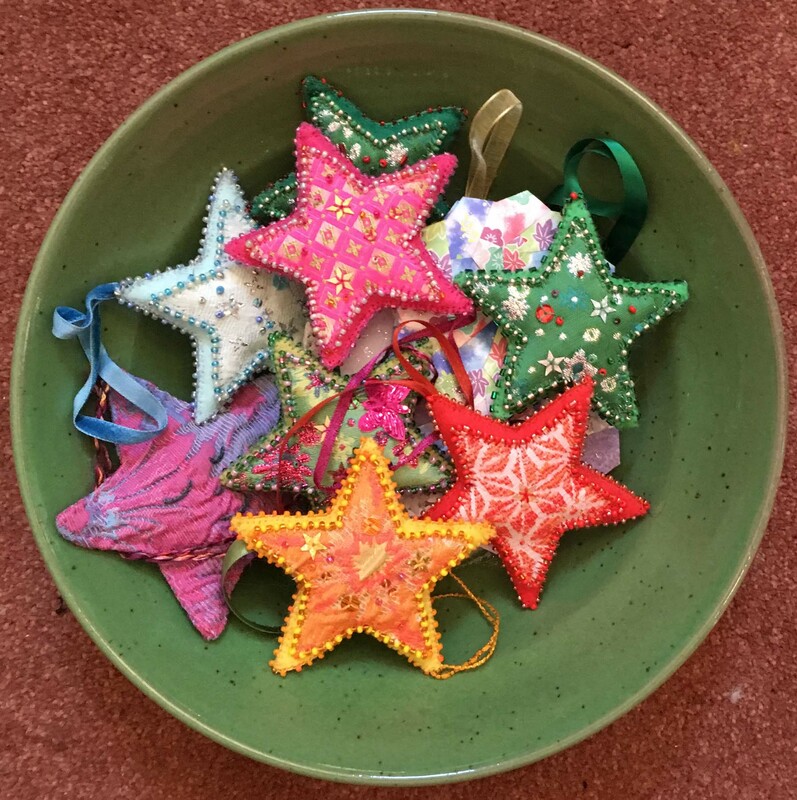 In brief, they aspire to reduce the horrific throwaway culture of Christmas and present wrapping paper by replacing it with beautiful handmade fabric wrappers which could be used and re-used many times. As it happened, my cousin Polly and I were looking for a project that we might work on together. In her spare time from music and Alexander teaching, Polly is a part-time printmaker. 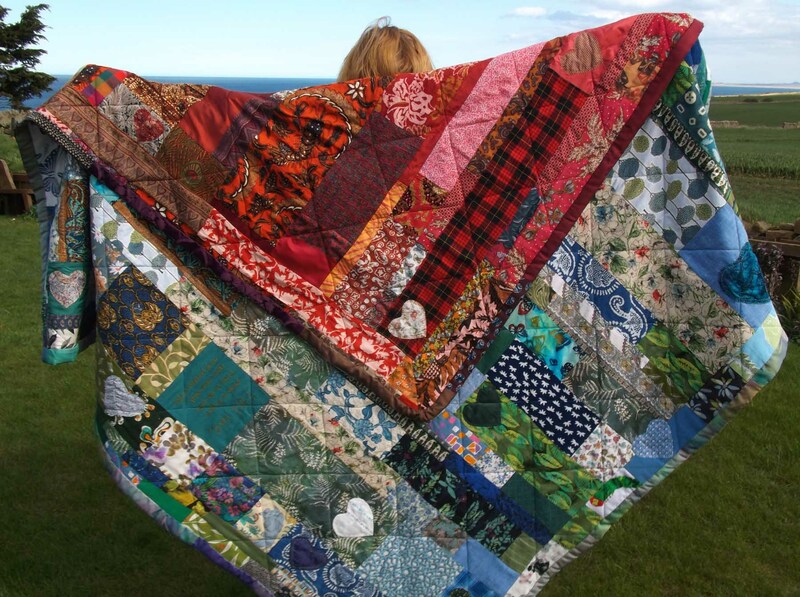 Together we evolved a system of making joint GiveWraps with her printed fabric scraps incorporated in my surrounding patchwork. We had such fun! Here is our first GiveWrap (you can see Polly’s inclining printed ladies in the centre bands). 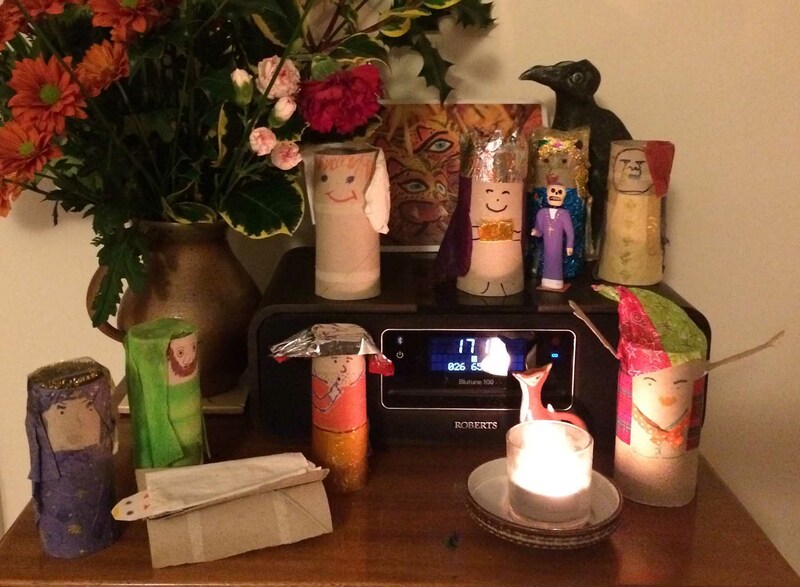 We made a lot of GiveWraps last Christmas. 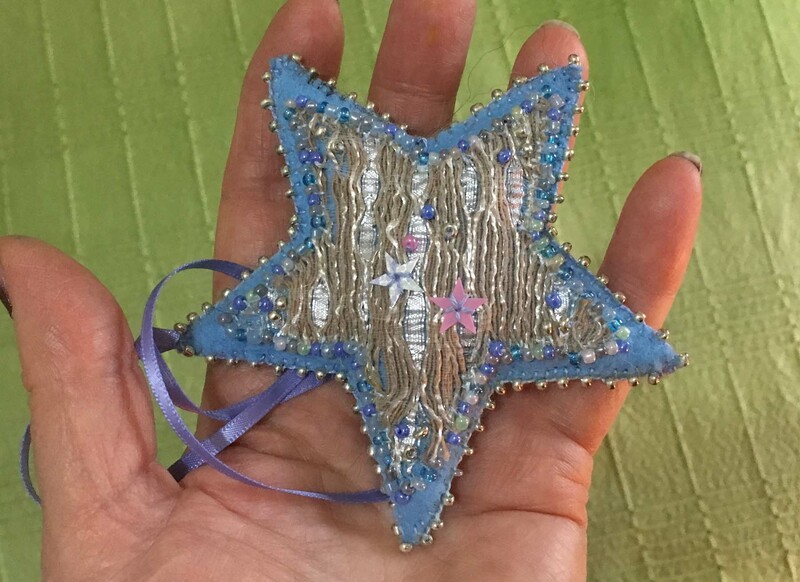 And I realised with a start that I was using up all my special fabric treasures on GiveWraps that I would probably never see again (the central tenet of GiveWrappery is that you pass it on, and then the GiveWrap is passed on again and again). Further inspiration came at Christmas when Polly gave me the powerful novel, The Invention of Wings by Sue Monk Kidd. This is a story of slavery in America’s deep south. 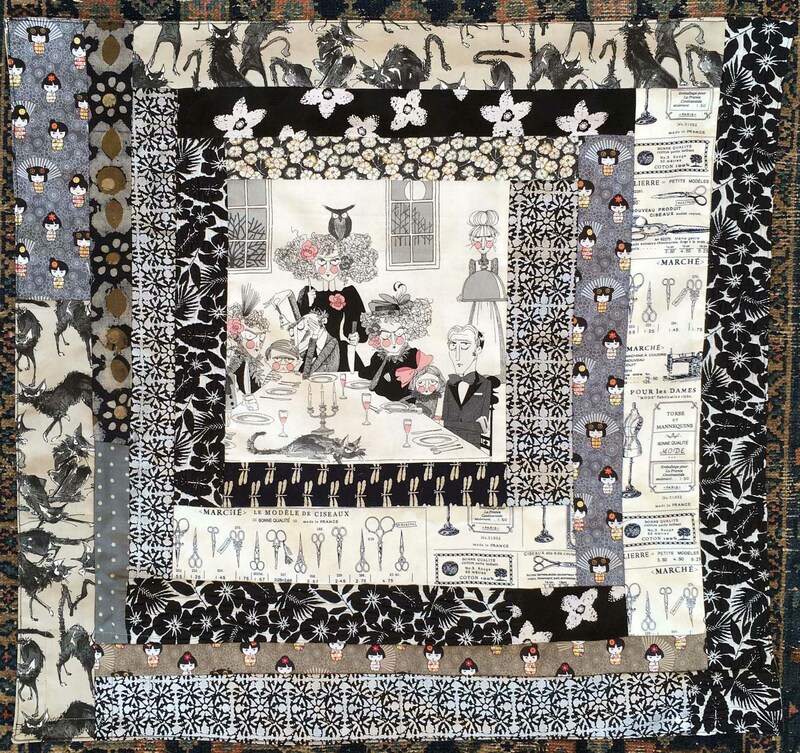 One of the slaves, Charlotte, is a fine seamstress, and makes a quilt to record her life story for her daughter. Aha!! 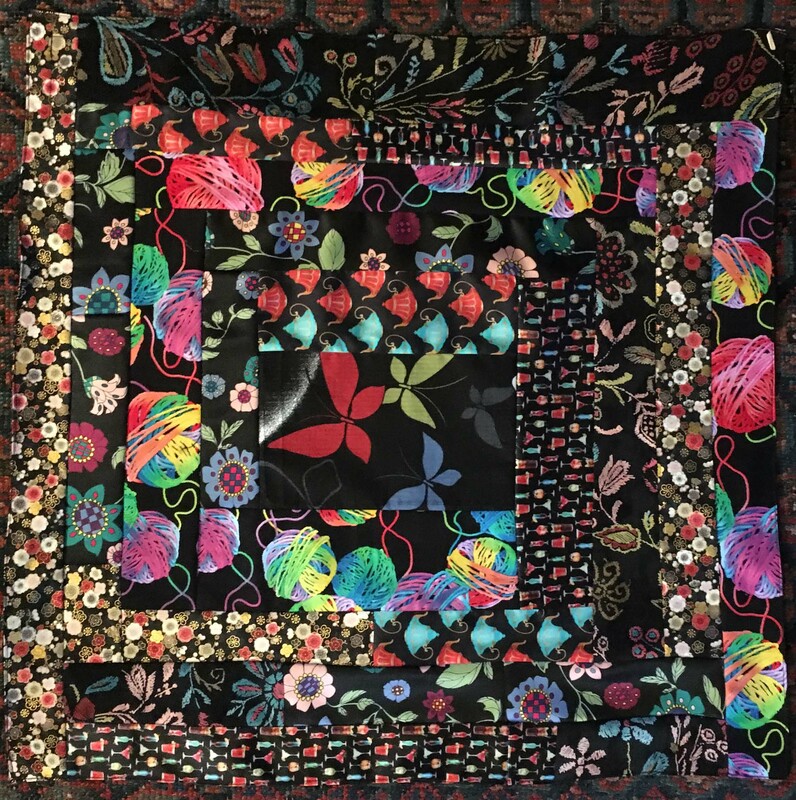 My quilt is nothing like Charlotte’s quilt (it’s arrogant of me even to compare them), but the seed of an idea was sewn, and I embarked on my own story quilt, sewing the odd fabric pieces together in the same way that I had made my GiveWraps. 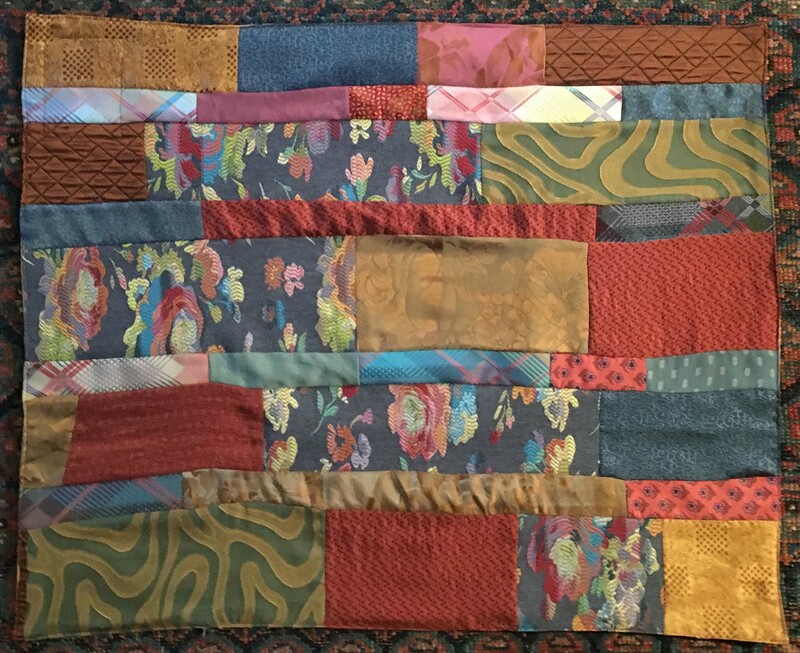 To give some sense of structure to what was really rather a haphazard quilt, I decided to restrict myself to the red, orange, yellow colour spectrum on one side, and blues and greens on the other. Purples and browns, blacks and whites crept in unbidden everywhere. I started with a mess. 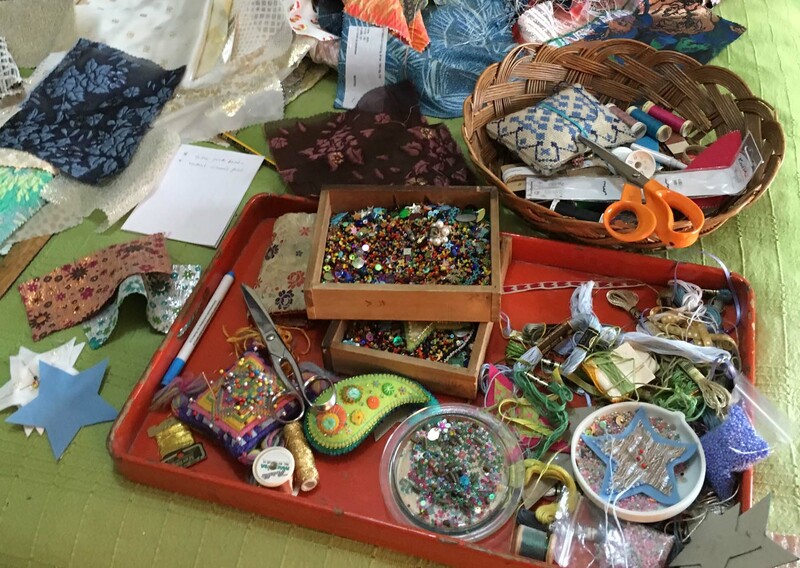 So many fabrics, so many scraps, so many memories – just so much to put in. In the end, I had to be strict with myself. 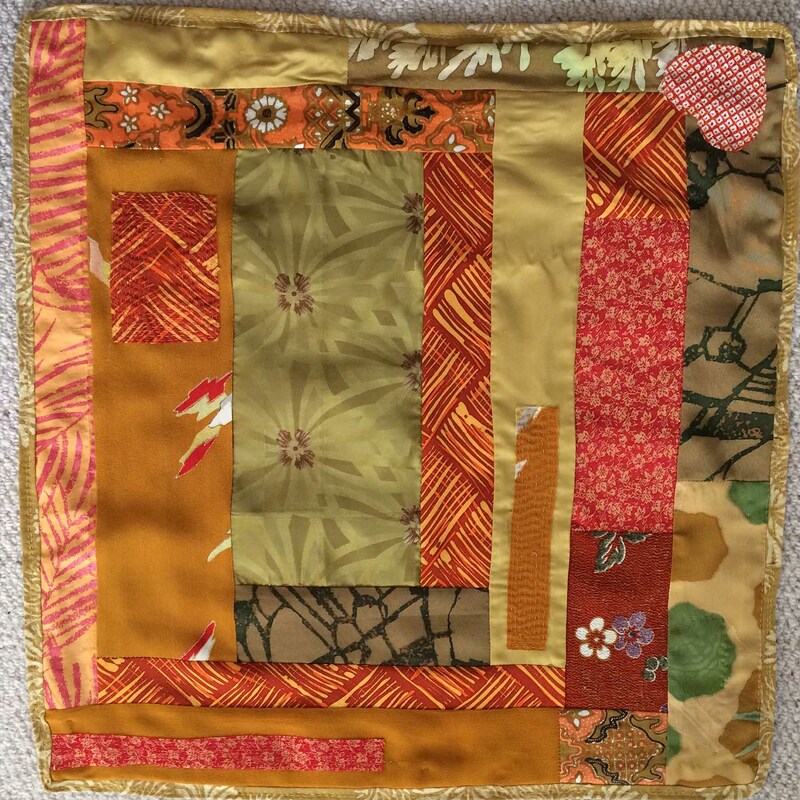 After I had completed the central body of each side of the quilt, I allowed myself to put in only one piece of each of the fabrics that were left in the mitred edges. Here the blue/green side is being built up to match the completed red/orange/yellow side. I added the polyester wadding to the red/orange/yellow side first. You can see my basting threads holding the two layers together. Our cat Poe thinks it is a new play place, and is not helping with the next step: adding the blue/green layer to complete the whole. 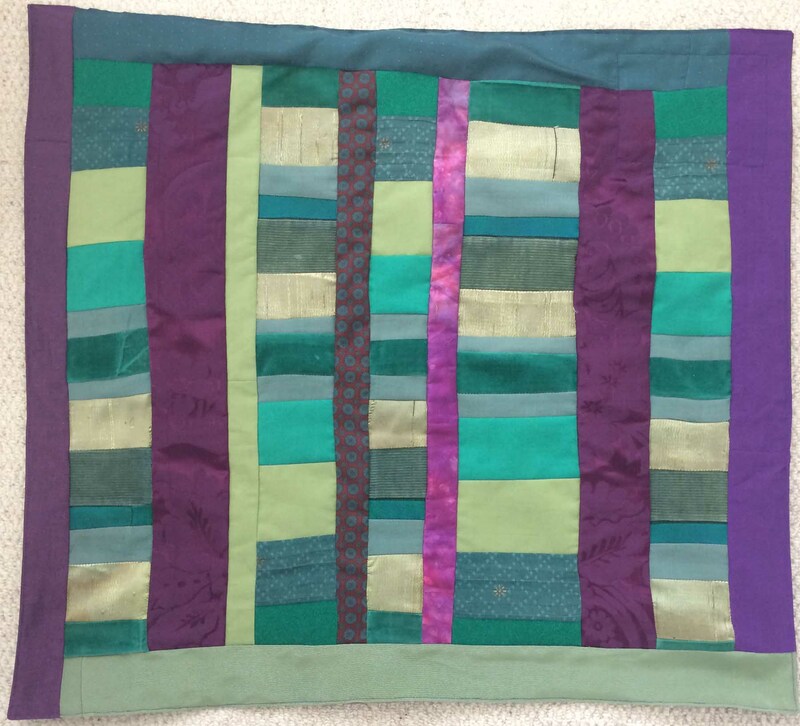 While all this piecing was going on, I was researching quilting methods – after all, this was my very first quilt. 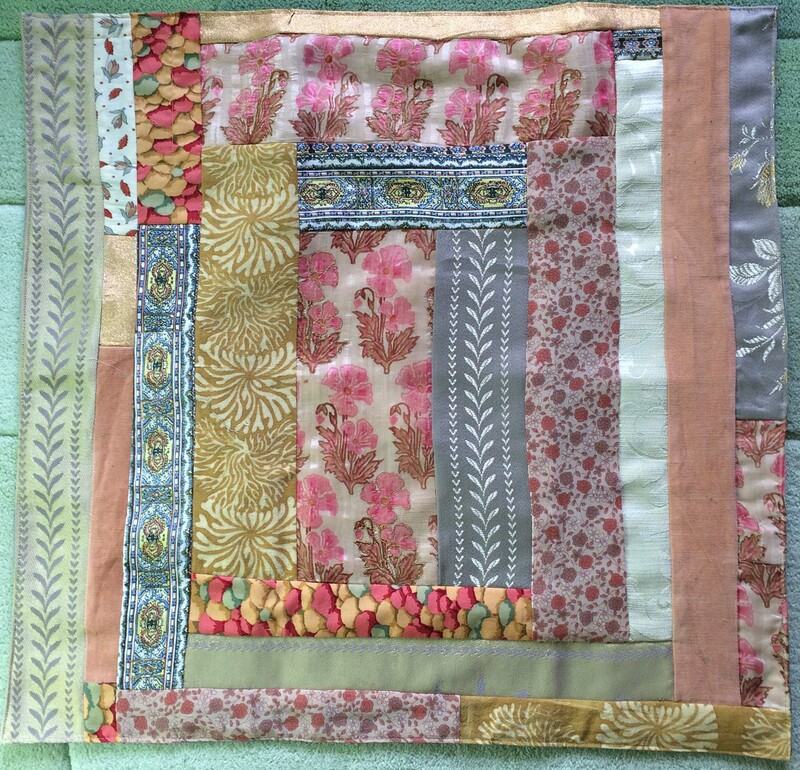 I watched youtube training videos, searched the internet for advice, dug out my mother’s old quilting and patchwork books. I invested in thimbles and a curious thing called Aunt Becky’s finger protector (which helps prevent you ending up with sore, needle-pricked fingers). With all three layers well-basted together, I set to with my thimble, Aunt Becky’s finger protector and needle. Disaster! 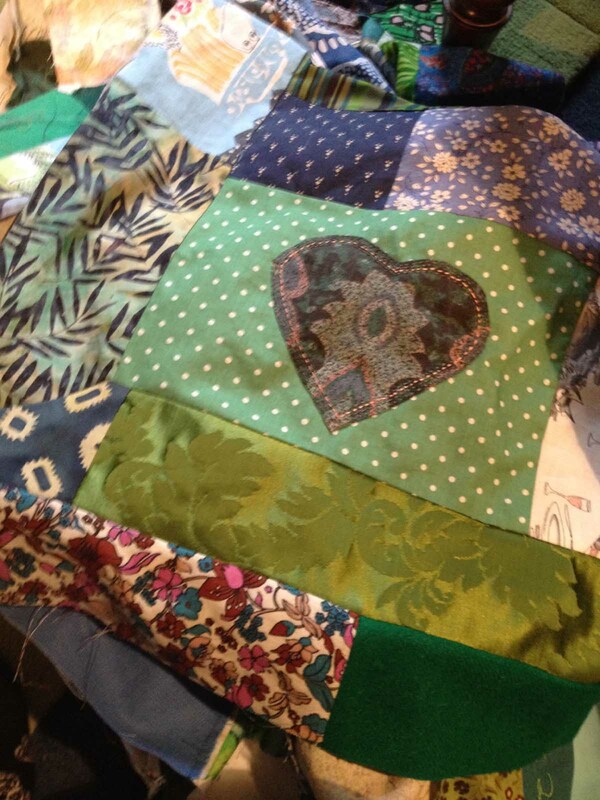 I really am very bad at quilting! My nice level running stitches on one side were completely wonky on the other. Nothing for it but to ditch the hand-sewing and turn to the man and the machine. The man is the measurer and calculator – absolutely essential if you are as dodgy with numbers as I am. Here he ruminates and studies my wonky efforts. 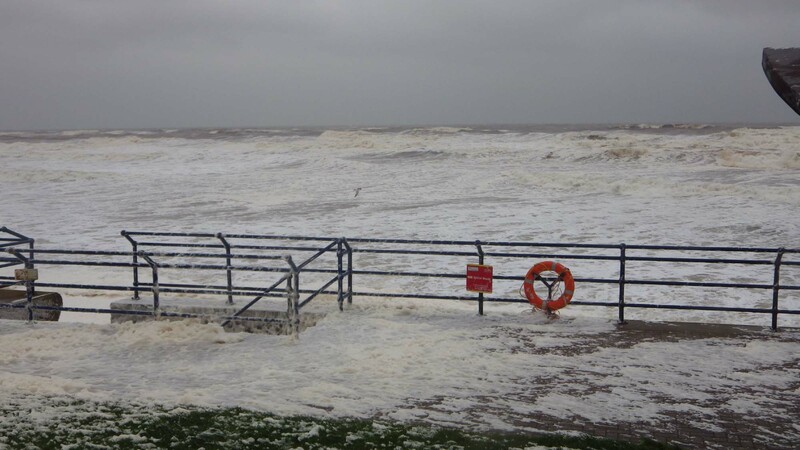 It’s going to be tricky to get straight measurements here……. 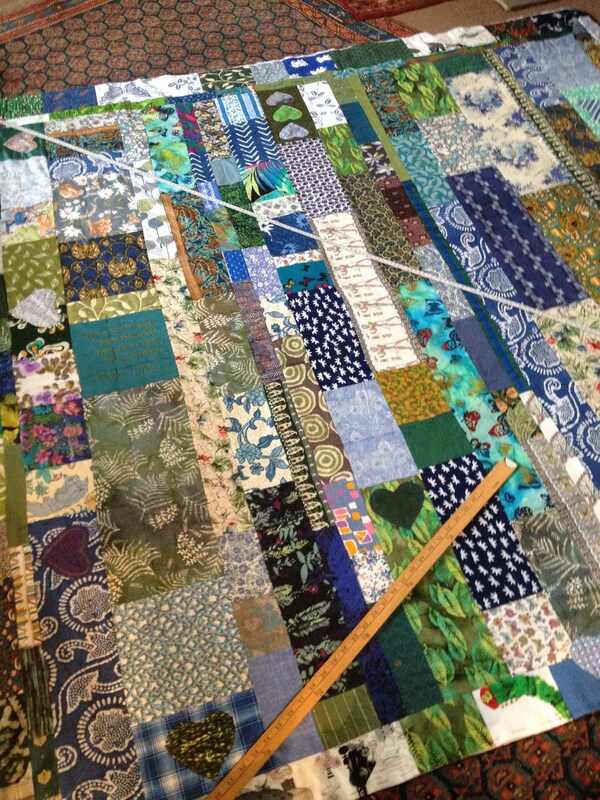 But with old-fashioned rulers and long metal tape-measures, we did get straightish white chalk lines on the quilt. They are 6.5 inches apart. 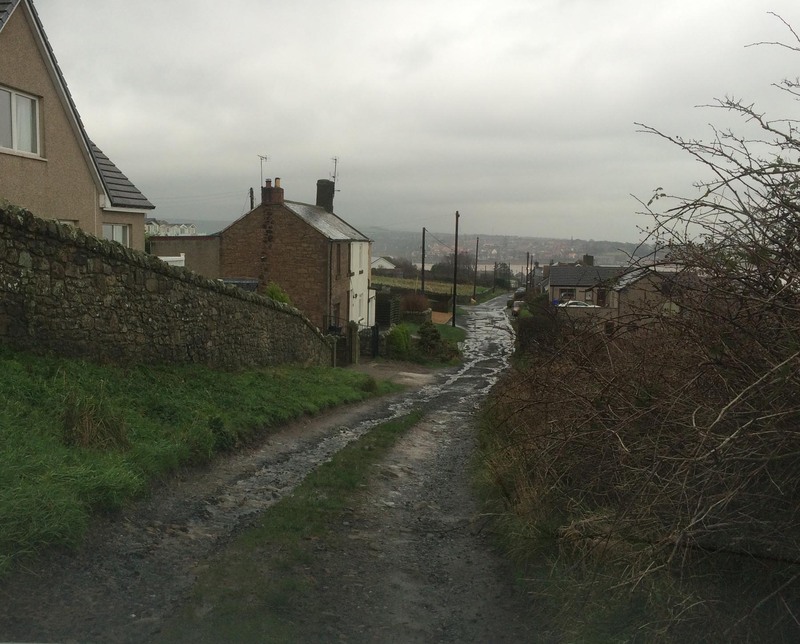 I managed to machine it up – just! I’m not sure my machine would have been able to cope with a larger or thicker piece of work. 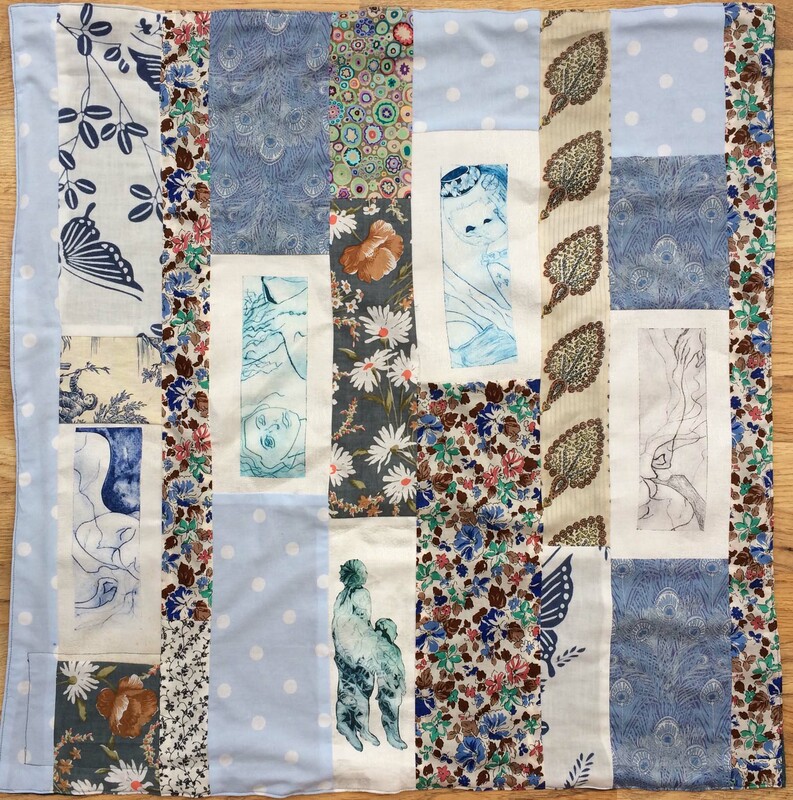 The machine quilting worked surprisingly well, and it looks good – I now had a proper quilt! Time for the edging. 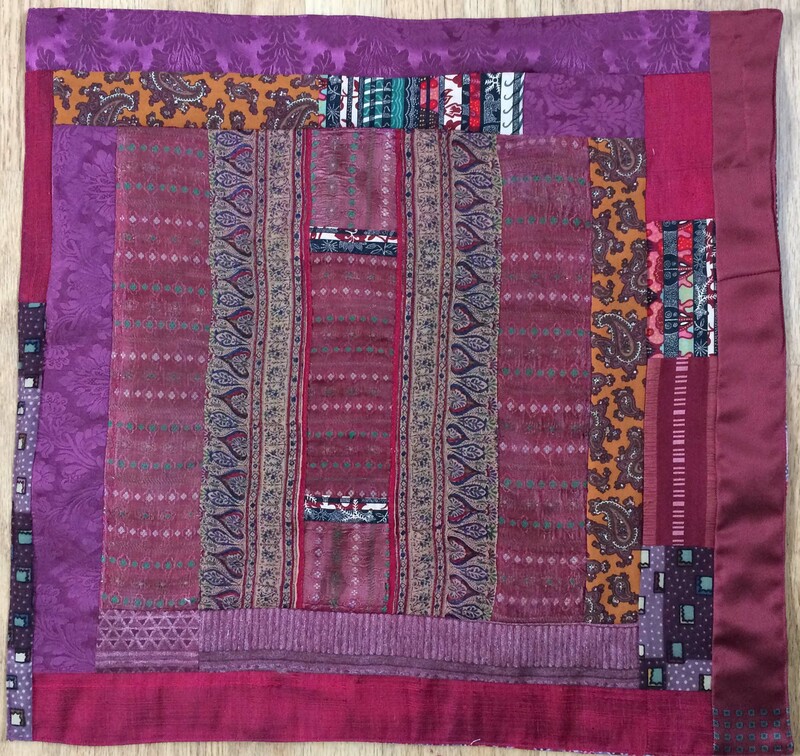 I’d originally planned to use a single strip of brown and purple fabrics for the edging, but it soon became clear this wasn’t going to work. The purples and browns planned for the red/orange side were far too strong and intense in colour for the lighter-toned blue/green side. So I had to make a special binding, combining suitable toned colours for each side. 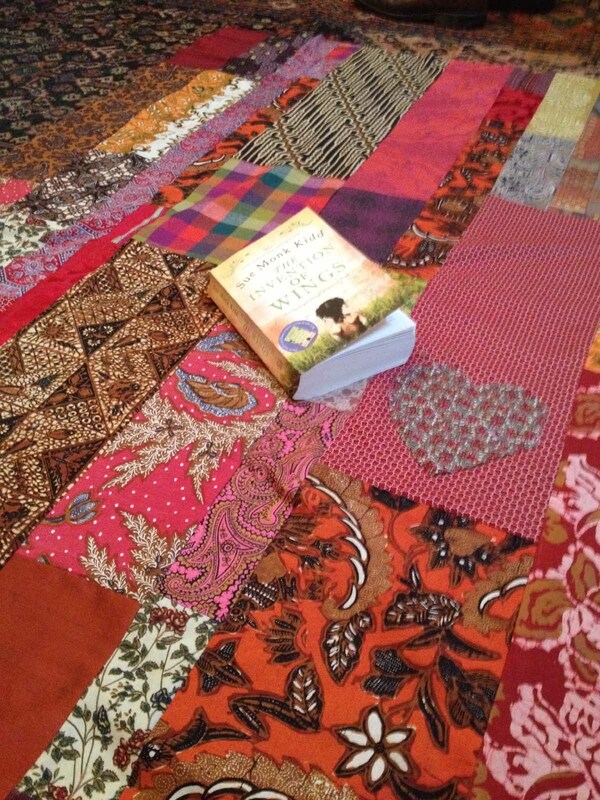 Then the bindings were hand-stitched onto the quilt. 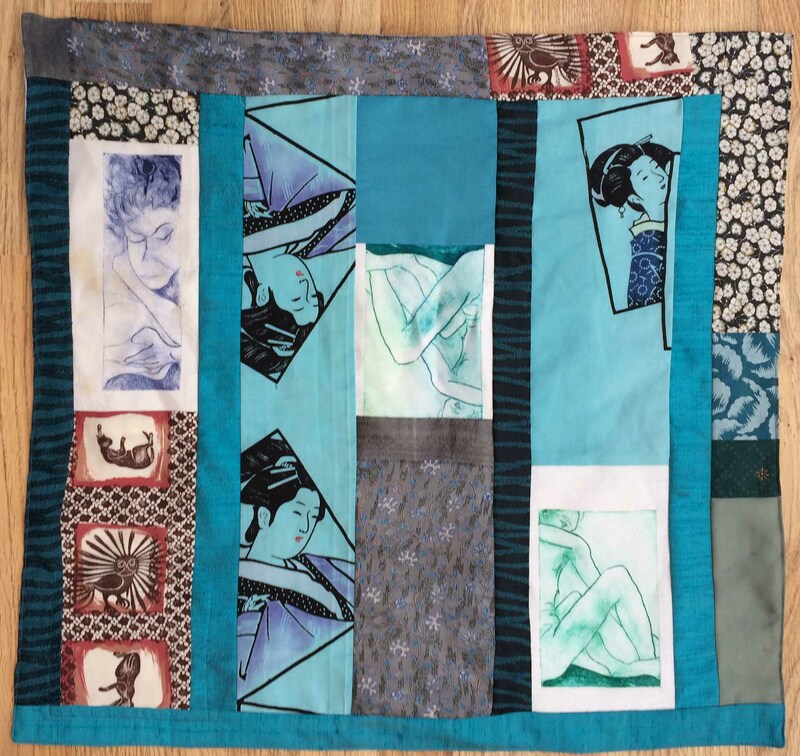 So what have I put in my quilt? Well, all sorts really. 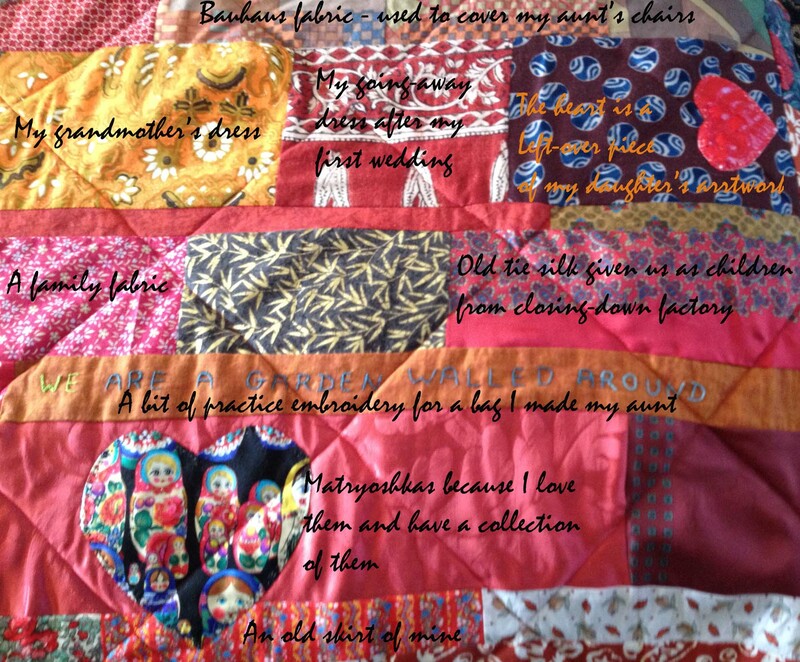 There are fabrics that have come from clothes I have worn, my sisters and mother have worn, and my grandmother wore too. There are little bits of projects I have started or done as test pieces. 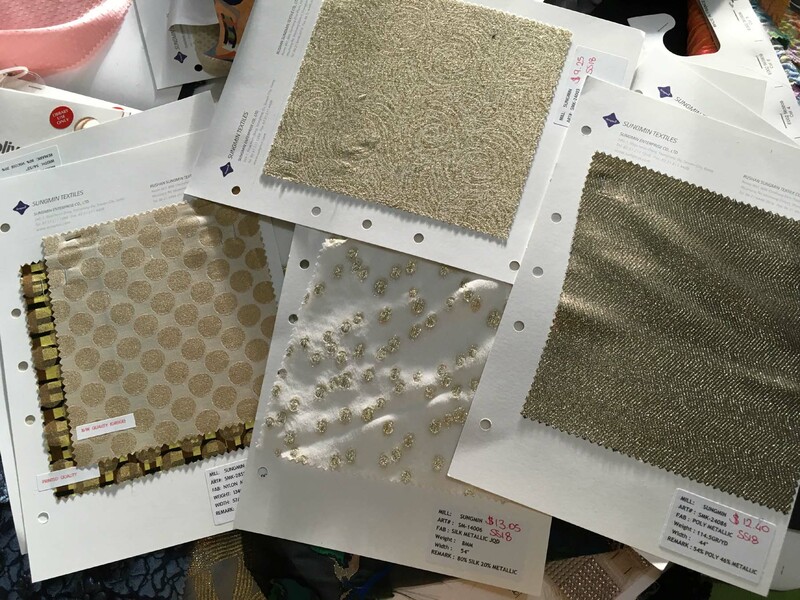 The fabrics used include silks, satins, cottons, tweed, towelling and jersey. (You can click on all these images to see the text more clearly). 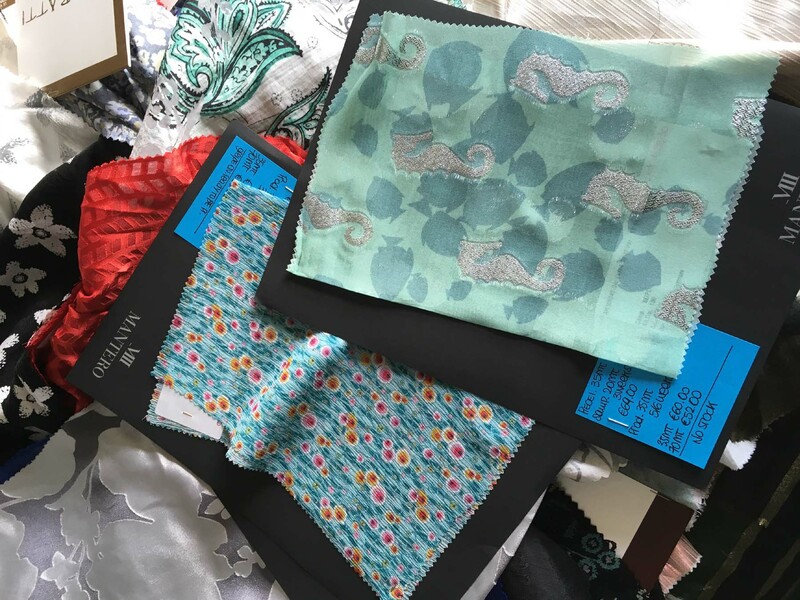 There are new fabrics, fabrics that have come from much-loved clothes, fabrics that have just been in the family for so long that I don’t know where they came from. 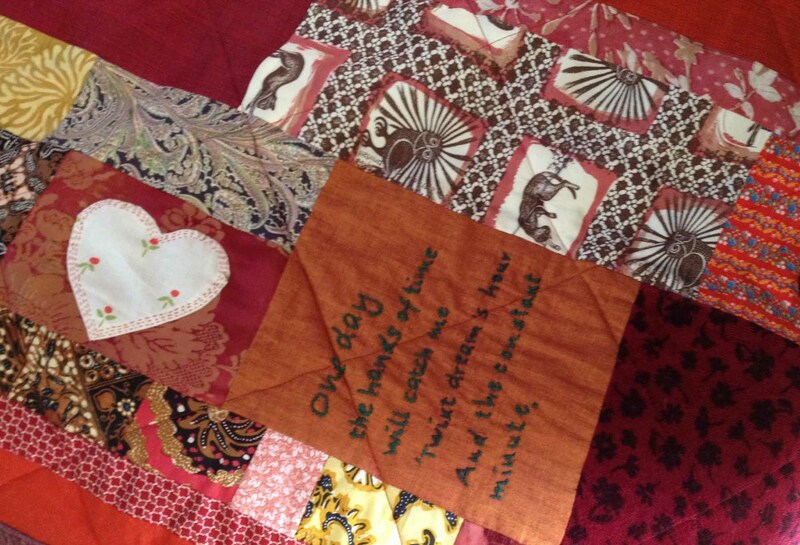 I have added my name to the quilt and the date and place. A little bit of Latin (and elsewhere Greek) since I was a student of Greek and Latin at university. There are knitting sheep at either end of my name – new fabric, representing my fleecy knitting interests. Then there are the hearts. 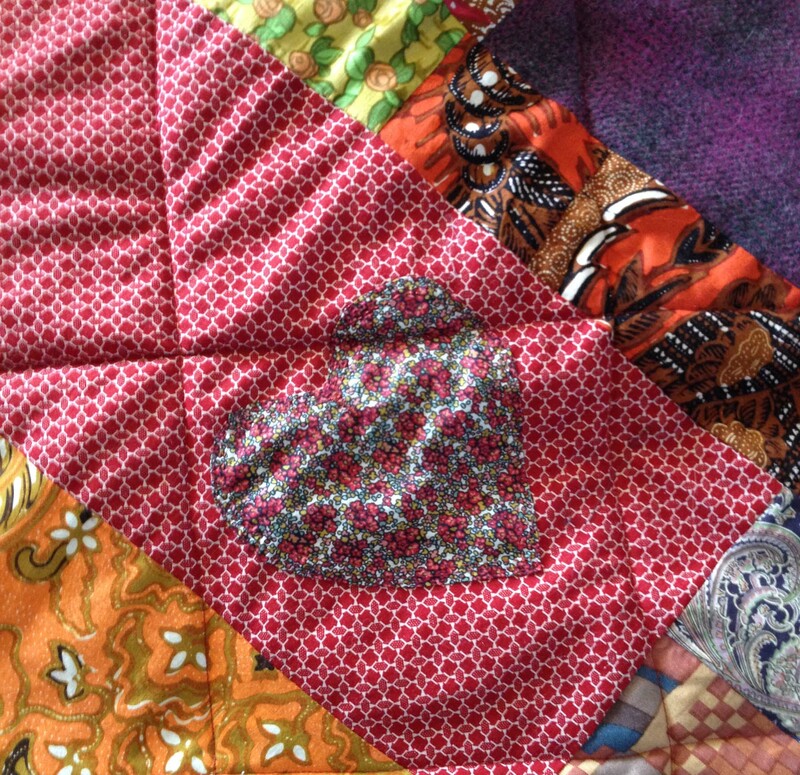 I put the first heart in because it was a left-over from one of my mother’s sewing projects. Then I realised that I had the perfect use for all those extra bits of fabric that I badly wanted to include but no longer had any room for. 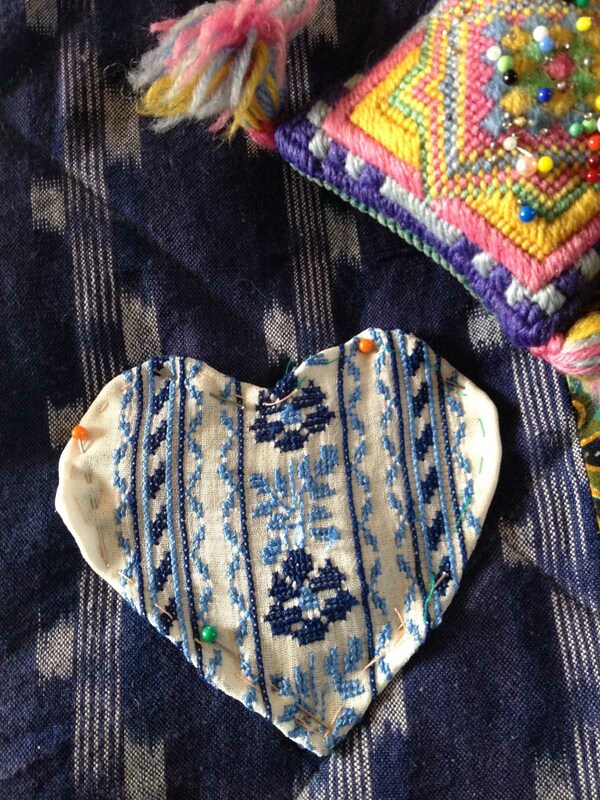 This heart is from an exquisitely embroidered Serbian blouse – it’s probably 50 years old as my grandmother wore it before me. The rest of the garment is yellowed and perished but the embroidered panels are still in good condition. There are bits of poetry too. The words in this photograph have come from one of Stephen’s poems. The squirrel in a go-kart in this photographic is fabric I used to make bedheads and pillow cases for my children when they were young. 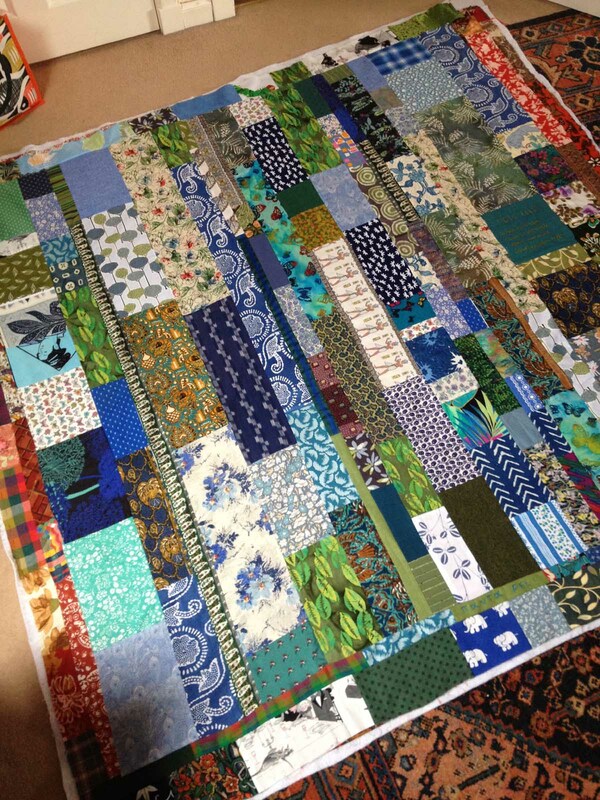 I don’t think my quilt will ever really be finished. This bit of text that I’m currently working on acknowledges Stephen’s help with maths and measuring: Mathematics by Stephen! 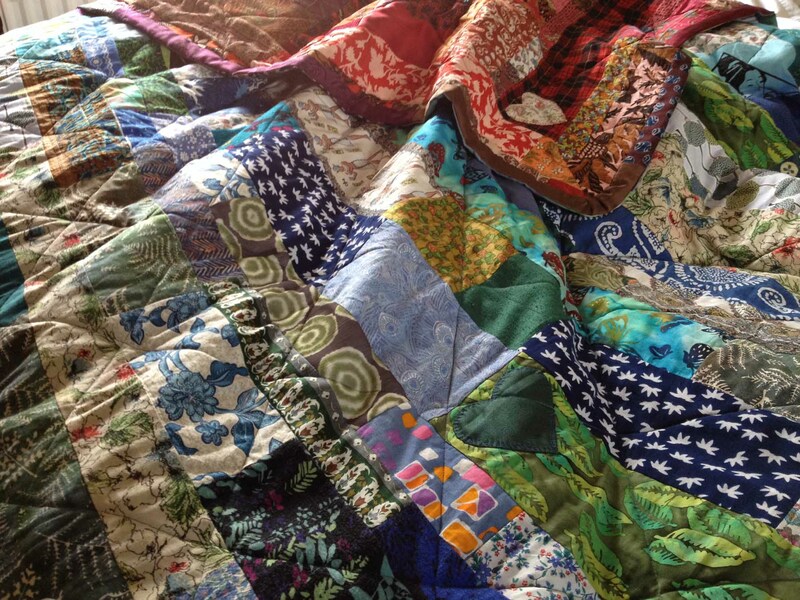 It’s a great pleasure to lie in bed under the quilt and look at all the pieces, to remember stories and people, events and places. 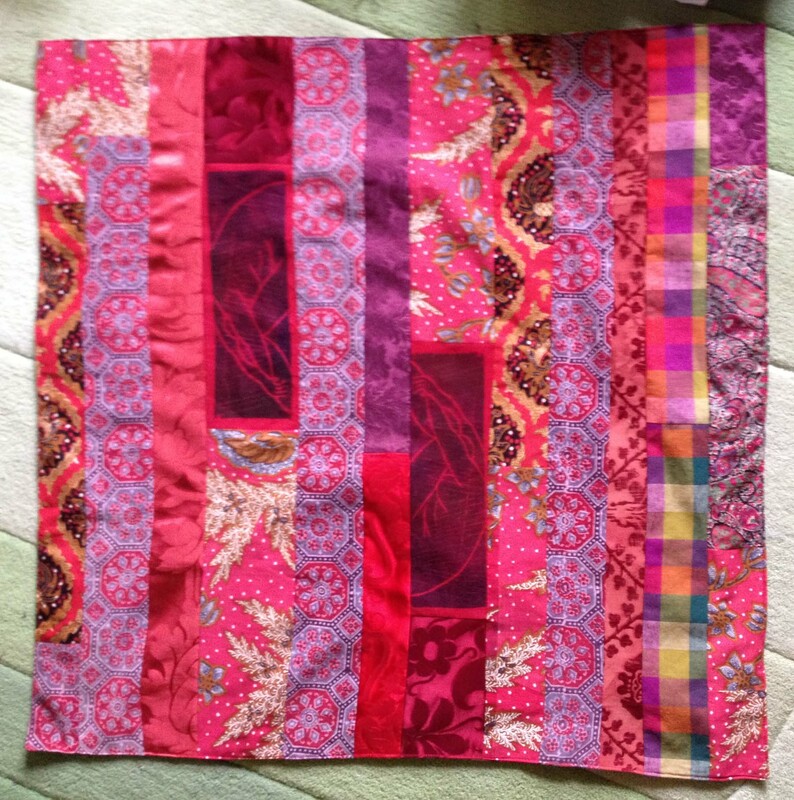 What I did not expect to enjoy so much is the handle of a quilt – it is so light and comfortably squishy. Perhaps I’ll just wear it for a while.